Edward James was a wealthy English artist who left a very special artistic work. 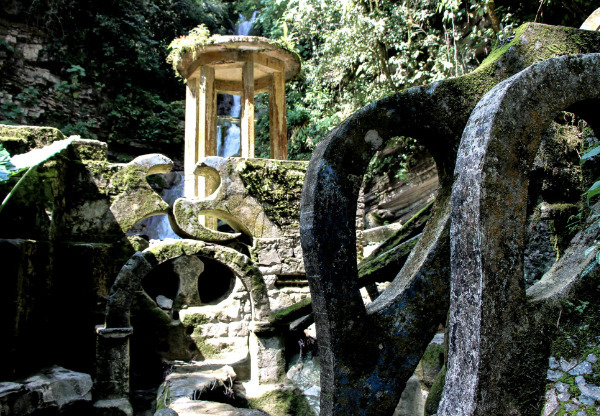 As a major supporter of surrealism, an art movement whose manifesto was described by André Breton as 'dictates of thought, without regulatory reason and devoid of worry concerning style and moral', he has created a sculptural Garden in Las Pozas, Mexico that is both beautiful as it is in balance as it is natural. A wonderful world nested in the green surroundings, built by more than 150 people under his (artistic) leadership. There is more on this artwork on the website (link). 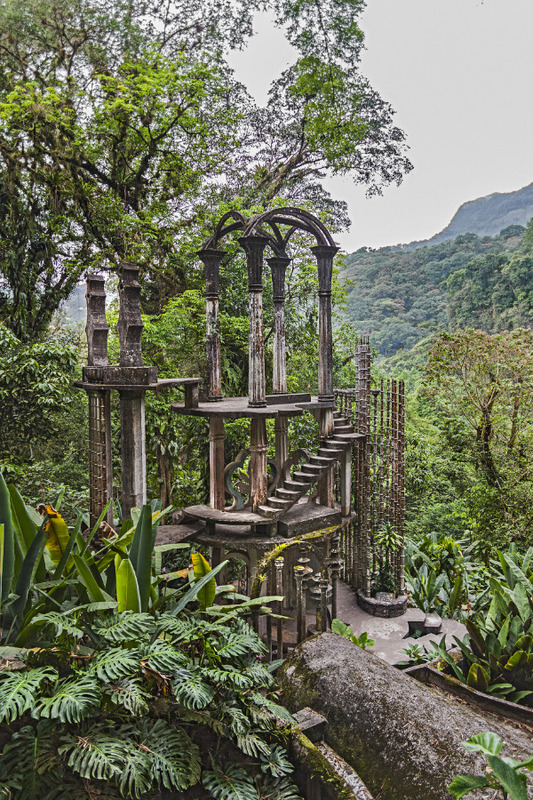 The site has been protected, restored and maintained by the Pedro and Elena Hernandez Foundation since 2007, thereby preserving this inspiring work. One of our projects we are very proud of has received a lot of media attention over a year and a half ago after we shared the photos. Various media outlets have paid attention and we have shared that happening with you in general. 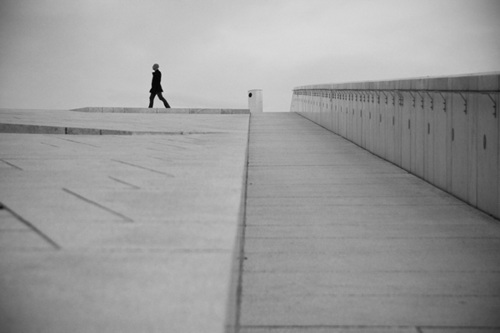 However, this article on the leading Architectenweb is worth bringing to the attention. Through the text there is more to read about the project and it is a great way to have a look at the project again. All the best for 2019, our good acquaintances have received a card with this sincere wish, we also like to share this message with you. If you have not received the card and do belong to our inner circle, you should definitely email us, perhaps something went wrong. Otherwise and in any case, hereby, to a beautiful 2019. 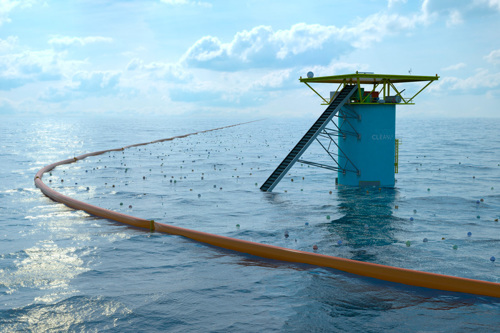 Years ago the Dutch Boyan Slat found an idea to get rid of the plastic waste in the ocean. This got a lot of media attention but that doesn't mean anything. 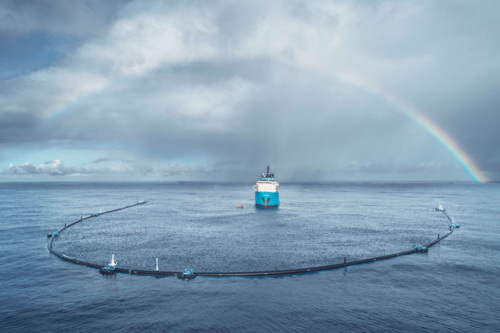 After a huge journey, he and his company The Ocean Cleanup managed to get a first ocean cleaner out on the sea. 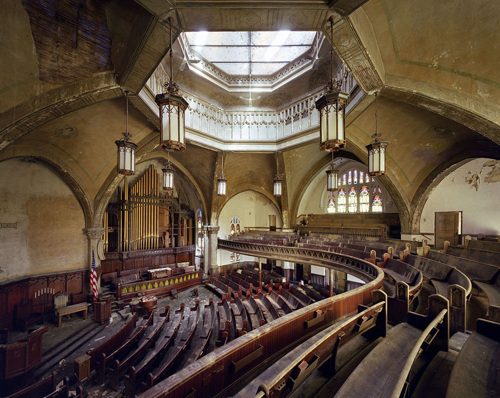 These photos are beautiful but do take a look on their website for much more information about this inspiring project. 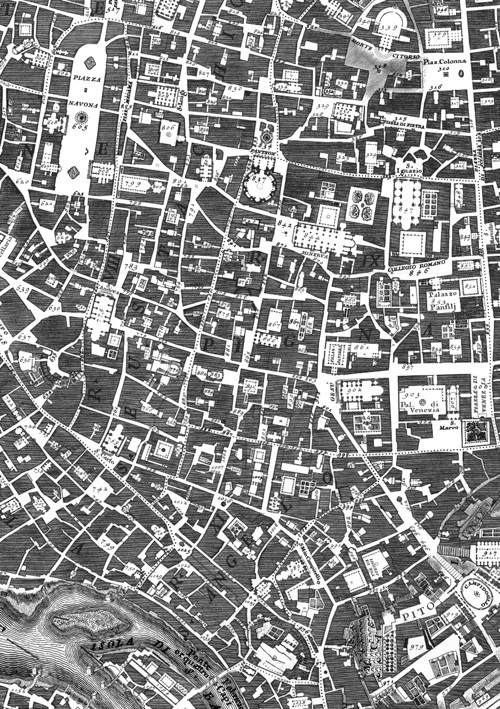 For millennia we have been aiming for good maps of our ever-expanding cities. 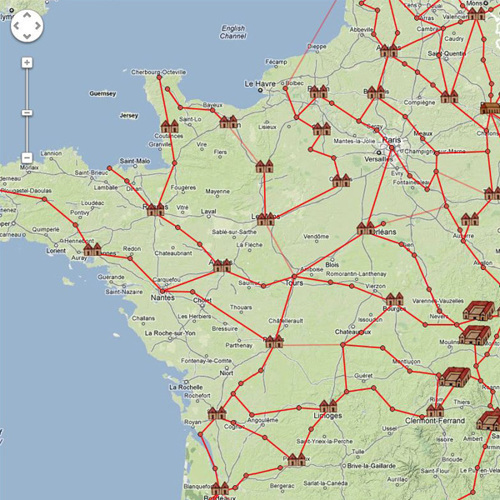 Over the centuries, different ways of mapping the city have been found. Giambattista Nolli may have found the best version of a map in 1748, and this may not yet have been surpassed, in our opinion. 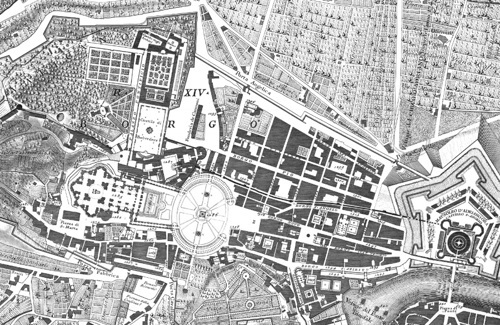 What makes his map of Rome so special is, in addition to the 12 years of measuring and engraving work, that he shows the difference in public and private spaces. Where, for example, the interior of the Pantheon is shown as it was a square on the street. All the very detailed parts of the map (of very good quality) can be found on Wikimedia. Worth seeing as far as we are concerned! 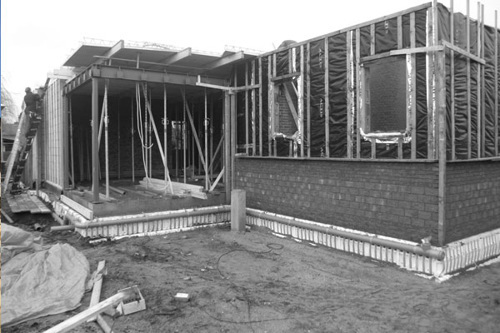 For a '30 house in Heemstede we redesigned the ground floor and made a design for an extension of the back facade. We enlarged the dining room and added a roof light, large oak window frames and an overhang with a pitched roof cladded with natural slates. 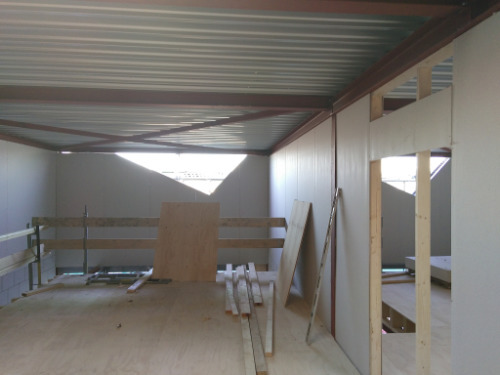 The contractor Pieter Hoek of Bouwbedrijf D. Hoek just placed the window frames and started working on the wooden facade and the overhang. The beautiful transition between the inside and outside is getting more and more visible. Soon more information about this project! The photographer, artist and dancer BAKi makes extraordinary art. From his experience with and knowledge of dance, he creates images that are made from and with dancers. His diverse work is well worth viewing on his website (link here). Above you will find two images from the Shadows series. Intriguing and beautiful. 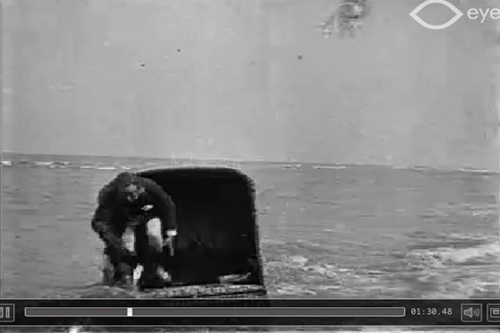 In 1932 the Dutch Zuiderzee was closed off by the Afsluitdijk. In 1942 large parts of the current Flevoland became dryland. In other words: New land, new opportunities and need for new villages. 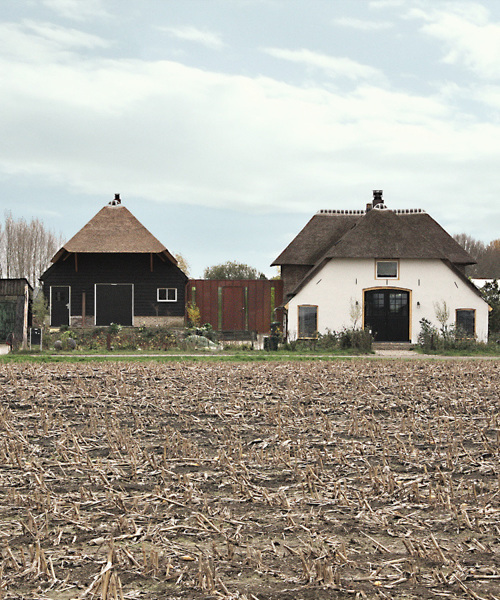 After a few of these villages were built in a very traditional way, a group of young and more modern architects decided to approach the government. In a letter they asked, freely translated, to be able to prove that it can be done differently. 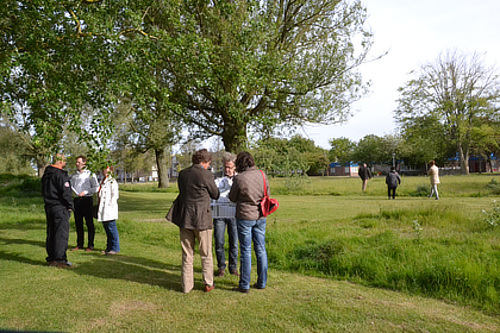 And indeed, this group 'de 8 en opbouw' was assigned for the design of a village which was to be built. 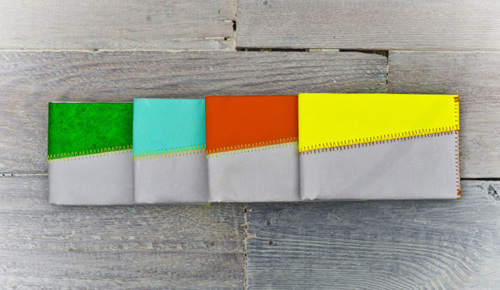 What follows was a very interesting design process and an equally interesting result. 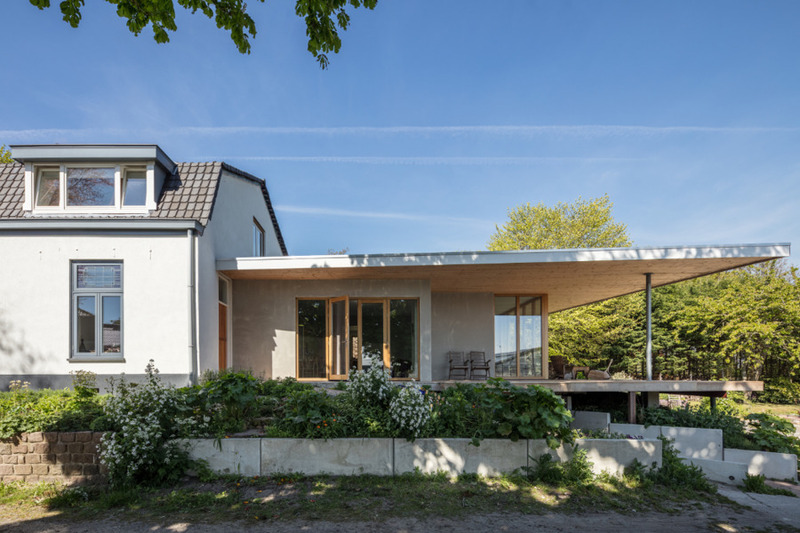 With minimal budget the (now) world-famous architects like Van Eyck, Rietveld and Bakema have renewed the architecture world from there studies for Nagele. 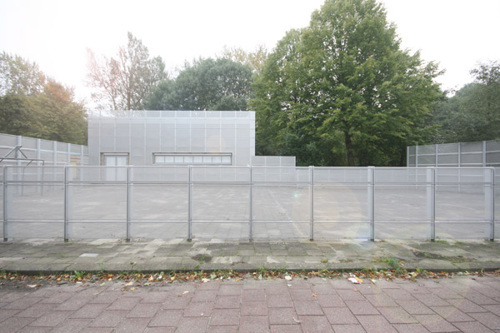 This has led to, among other things, an almost prototypical new Dutch school (Van Eyck) and the basis for what would later become the Lijnbaan in Rotterdam (Broek Bakema). More about all this can be found here (link) and you should definitely stop by Nagele for a visit. When looking for a new home you are most likely searching for a preexisting house or a house thats just completed by a developer. 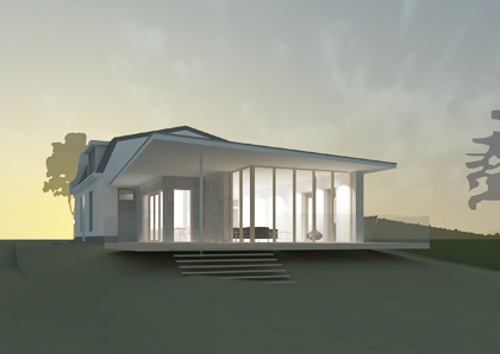 In the last case, a developer realized a house designed according to the average housing needs. Of course, this can result in a good and affordable house, but its also possible to realize a house thats been designed specific to your needs and wishes. 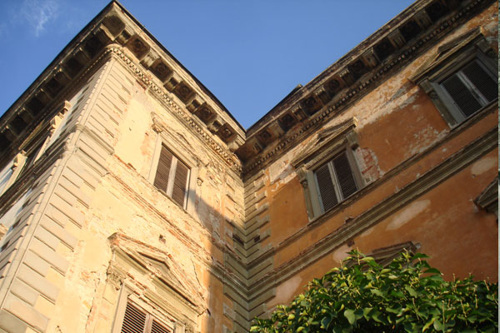 In this case you can be the developer of your future house, a process that can lead to beautiful and originals results. The next step is joining with other interested potential private developers. This process is done a small scale in the Netherlands and is called Private Collective Development. Because you develop your own house, it will be exactly according to your own wishes and there are less people involved in the process. You are also more involved in the overall process, both designing and realizing, in our opinion a very positive experience for the future owners. Next to that its also possible to create a more sustainable and social public space because you can design it with your future neighbors. For more information please contact us by phone or email. Japan is a special country with its own culture and its own taste and view on aesthetics. On various subjects, the way of thinking in Japan is almost opposite to Western thought patterns and ideals. 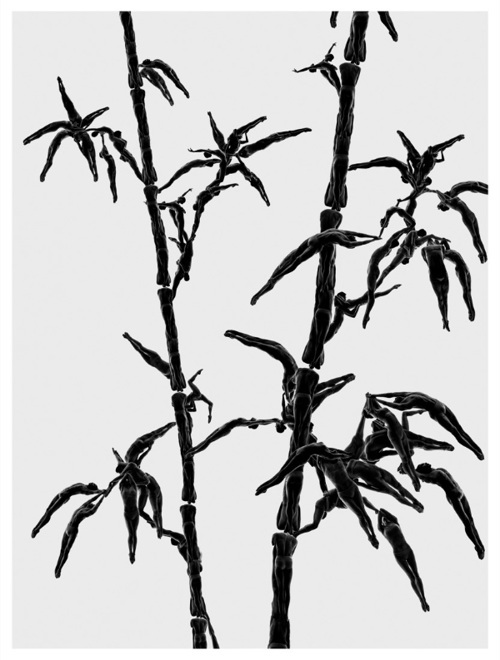 Wabi-Sabi is a widely known term in Japan that can not be translated properly, but fits well with what we described above. Freely translated it means something like 'the beauty of imperfection and incompletion'. It has to do with a certain beauty in 'aging and in simplicity'. Wabi-Sabi is a combination of, again freely translated, 'rustic and rest' (Wabi) and 'beauty that comes with change with aging' (Sabi). 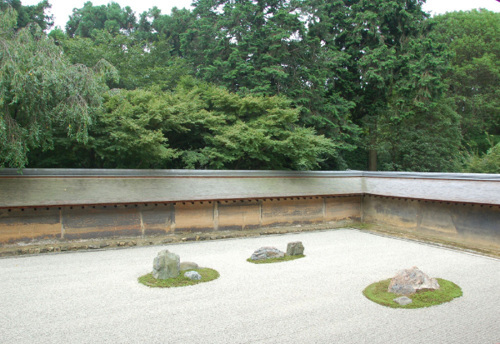 Together this term represents an ideal of beauty which is very different from the Western ideal, but of which we can, for example by looking at the world-famous garden (on the photo) in Kyoto, understand that it possesses beauty. Hong Kong is a city that has grown at a tremendous pace in terms of size and continues to grow at this pace. The green has made way for steel, glass and concrete. 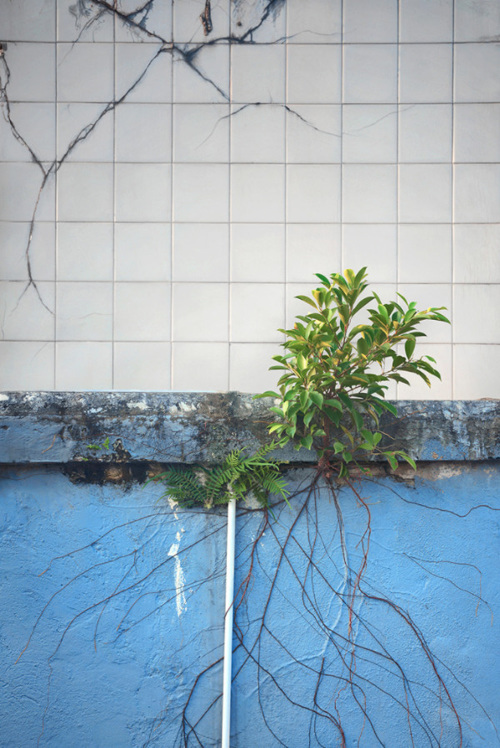 However, due to the warm and humid coast climate, nature doesn't need much to be able to re-establish itself. 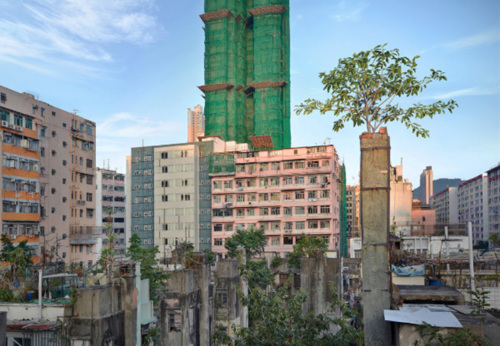 Romain Jacquet-Lagrèze made an imaginative series of photographs about buildings of which the concrete is slowly but surely serving as a breeding ground for the green. The concept, that this phenomenon is happening, is interesting and confronting at the same time. The images in themselves, without the theme or content, are very beautifully made. There is a book (a.o. via Amazon) (which, of course, we have in the office) for the real enthusiasts. 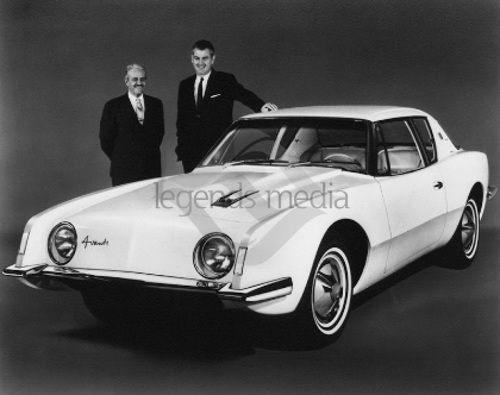 Raymond Loewy (1893-1986) was a gifted designer who didn't take the world around him for granted, by many he was the father of industrial design. A lamp, a car, in every object around him he saw ways for improvement or redesign. In his long career he designed many different objects, like a Coca-Cola vending machine, the Shell logo, a steam locomotive and the interior of Skylab for NASA. An impressive oversight of his career can be found on the Wikipedia page. This personal interview from 1979 with him give an insight in his way of thinking and is interesting to see for every designer. Tesla keeps amazing and keeps innovating. The self driving car in the short film shown above seems to come straight from a futuristic movie. Especially with the graphics on the right side showing the analysis made of objects in the surroundings. The cars Tesla sells right now are not fully autonomous because the technology is still developing based on tests and driving kilometres (fleet learning). But, all Tesla's built since October 2016 do have the hardware which makes it possible to have a 360 degree view around the car, a big step towards full autonomy. Enjoy watching these impressive images. More information can be found here (link). And if you scroll down through our blog, you'll see that we wrote about Tesla in 2013 to tell you about these pioneers, and now they are where they are. Fascinating. 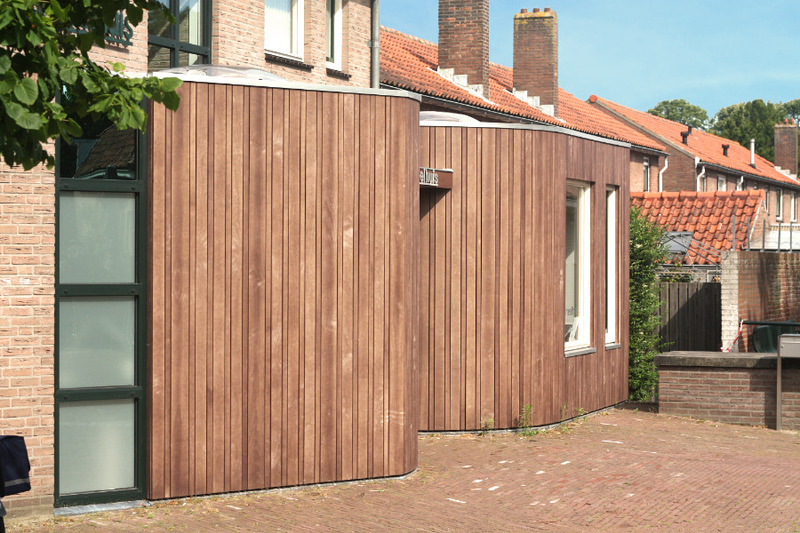 For the extension of this house in the famous Dutch flowerbulb area, we made a design based on the experience of the transition from the inside to the outside. 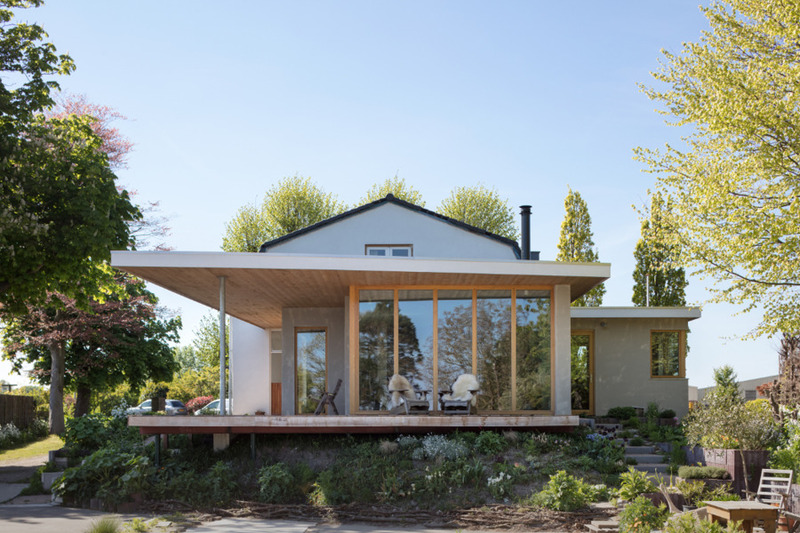 The old house (the inside) and the garden with the flowerbulb fields behind it (the outside) are beautifully connected by this distinctive and sharply detailed extension. More pictures and more information about this project can be found on project page on our website (please click here). 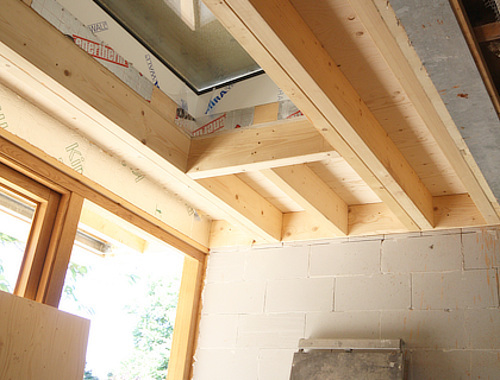 The House of Representatives agreed, at the beginning of this year, to a new law which will have a significant impact on the way in which quality is guaranteed in the building process. Currently, this is done by the municipality. They check the drawings at the application for the building permission. However, this will change. From the 1st of January 2018, an external party will check the quality during and after construction. We particularly hope that this privatization will not lead to additional costs for the clients. We will keep an eye on developments and keep you posted. The height of the ceiling of the spaces we live in is a very important part of how we experience these spaces. It's good to add that the perception and appreciation of a space is closely related to materials and colors, to natural light and sight and to the other dimensions of the room. So, it is interesting to ask ourselves: Can we determine what an ideal ceiling height is independent of everything? This is difficult, but fun and interesting to discuss. 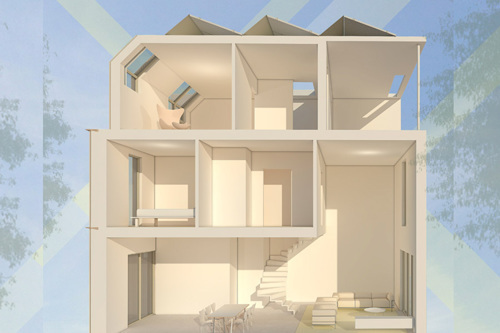 When we apply this question on the typical housing we know, starting from 50 to 60 square meter apartments to 180 to 200 square meters of houses we could ask ourselves: What if you can build such a house with the measurements you would currently build it with, but you can choose the ceiling heights themselves without thinking of money. What ceiling height would you choose? The artist, inventor and scientist Theo Jansen creates fascinating "beach animals (strandbeesten)". Ingeniously designed skeletons that can propel and exist 'without food' and can 'walk on air' (in the words of Theo Jansen). 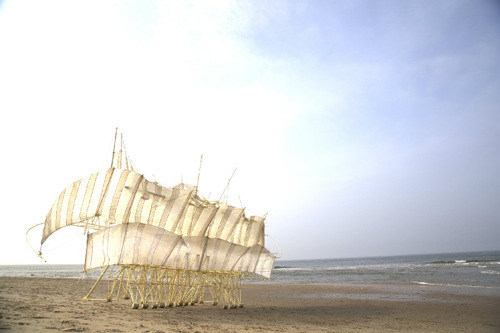 Take a look at the enchanting images, for more information please visit his website strandbeest.com (link). A time-lapse of the changing of materials, in this case floortiles, when influences by daylight and shading. Of course, this is just a small experiment, but it might be interesting to share it. It is part of our research into dayllight about which you can find more here (link). 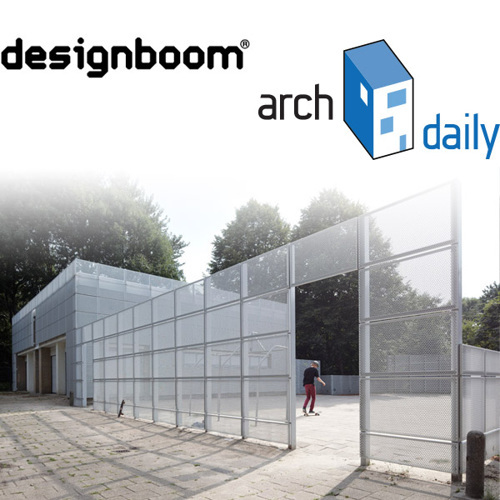 The website Archined is an online platform which was founded 20 years ago, with the aim of spreading independent knowledge and to debate about the built environment. 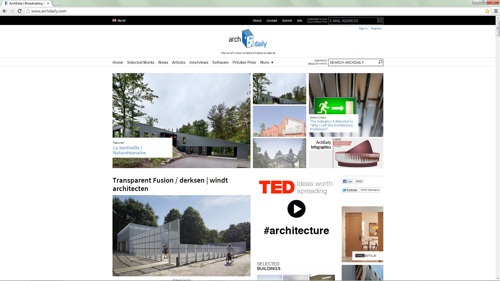 Of course this website contains various projects and amazing references, but in our eyes especially the articles written by other people active in the planning and/or architecture are enriching. If this subject interests you, this website is definitely worth it. 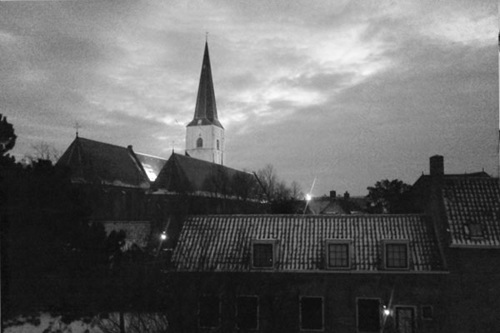 An example of an fascinating article is 'The Prudential, Warschau' by Ton Verstegen. 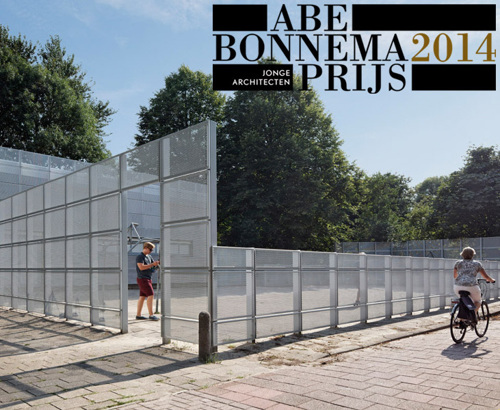 Our research on shrinkage (read more here) has led to a request to write an article for the magazine Urbanism & Architecture (Stedebouw en Architectuur). Of course we wrote the article (in dutch), the result can be read here (click to open PDF). 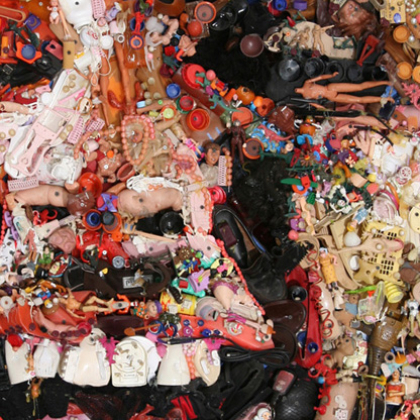 The website Artsy has a huge online database of art. For example you can find information about the artists themselves and take a look at their work. 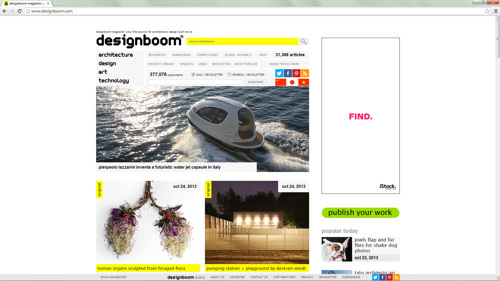 It is definitely worth it to take a look and is good to remember when you are looking for a certain work of an artist. Finally, it is also very interesting to just look around and discover new artists and art. The light artist James Turrell, we mentioned earlier in our blog, can also be found on this website (link). 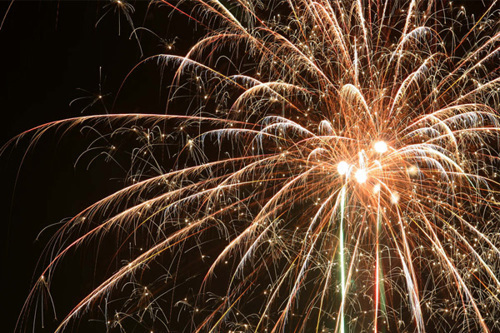 We wish you inspiration and enjoyment. The Netherlands, but also parts of the rest of Europe, has a number of municipalities and regions that have to deal with declining populations and a changing compound of inhabitants. These municipalities and regions are also known as shrinkage areas. Young people move to the big cities and the population that is left in the villages is aging. Shrink causes unoccupied houses, offices and empty shopping areas, which has a major impact on the spatial development and the quality of life. Shrinkage is often contested by investing in these shopping areas and by building more high-end houses in order to attract new inhabitants. Because of our interest in the built environment, we have investigated the causes and the possible strategies to solve the problem of shrink. "Acceptance" seems an unpopular, but good and sustainable solution. In this strategy a city, town or region is forced to think about his abilities and to emphasize these. This ensures that the quality of the environment increases for the current residents. With the result that the population fall will stop, and even an increase may be possible again. For example, reinforce the historic centre by improving access and identity and do not invest in the shopping area with the vacant shops. Tackle the problem at the base and prevent afterwards �stop-gap� solutions. Only in this way you can create a sustainable and stable future. The full article you can read on our research page. 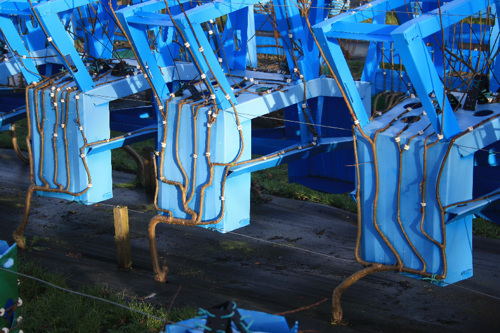 The British designer Gavin Munro has developed an ingenious and original method, whereby the furniture grows by themselves into furniture. His vision is to go back to the base and make use of what the nature has to offer. However, the process is structured and controlled by a human being. 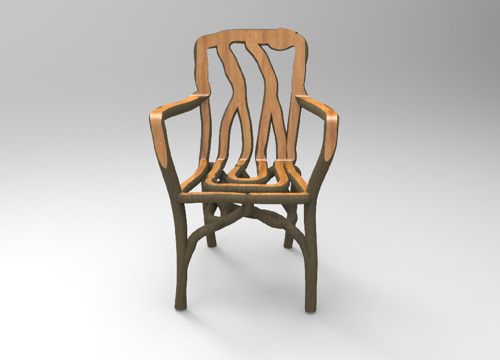 On the website you can read more about how these chairs form themselves during the process. 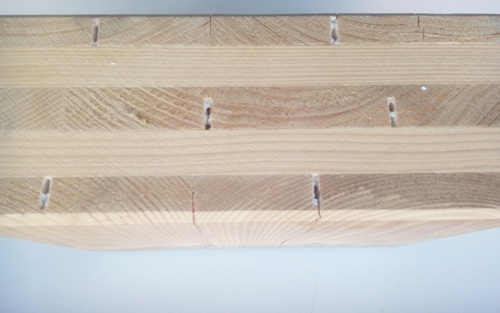 Beside this interesting trial, the most interesting part for us may be the end product, which is also very beautiful. A lot of sustainable designs emphasises too much the sustainability of it. 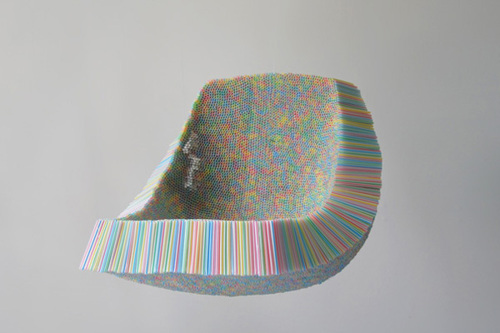 But in this case the accent is on the basic principle of the construction of the chair. Which is refined and provides interesting and beautiful furniture too. We had the opportunity to make a design for two new entrances, commissioned by a owners association of a appartment building. . The design is received very positive, it is not build (yet), but we thought it is worth sharing it. 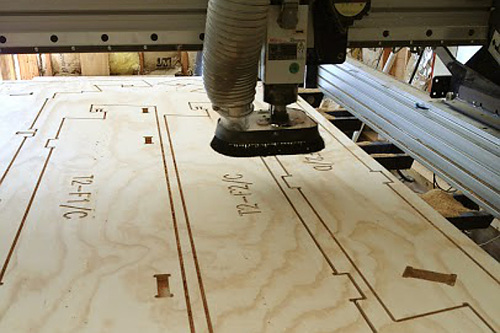 It really is possible to build a house by lasercutting wooden plates (printing) and then put them in place. In fact, the actual building only takes a few days. Obviously there must be a foundation and connections that are ready to use, but when you have that, the house is built within a week. How innovative is that? 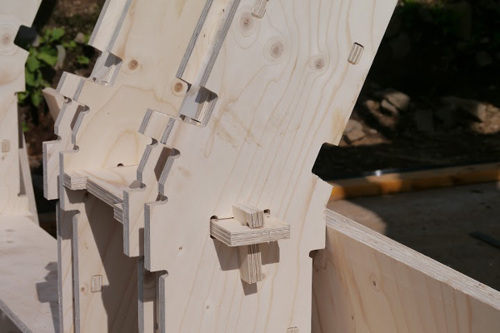 This concept was conceived and developed by the people of Wikihouse, but the intention is to freely use, improve, develop and apply this concept. 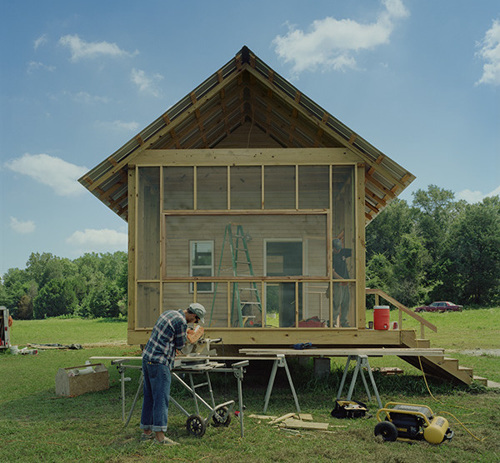 The possibilities are enormous: think about quickly rebuilding houses in disaster areas, building good houses in developing countries, but also building your own design, for example beautiful wooden pavilion-like houses. We are very excited about this project, therefore this title with a nod. But to us it seems quite interesting and refreshing to work with you, according to the Wiki House system and design and build something. 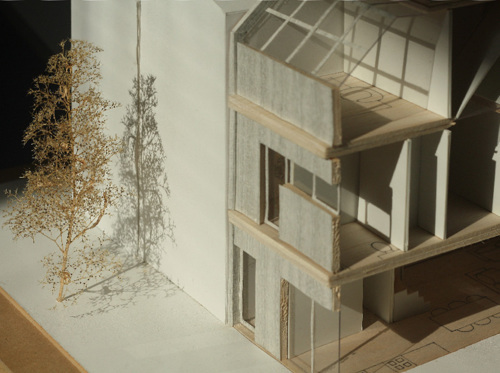 So, CLIENT WANTED for PRINTED WOODEN HOUSE (outside or garden)! 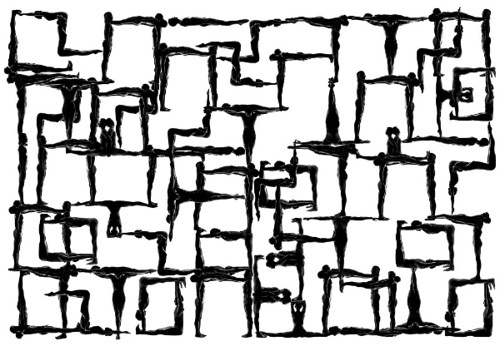 Being an architect we are very interested in what happens in society. Like we wrote in one of our previous news articles; gathering of people, the society in general and the experience of people in the built environment, has our highest attention. We do our best to design with this idea in our minds and to do research on behaviour and perception. You may have heard that there is a lot of attention recently for the idea to set up a �basic income�. This is a principle in which every inhabitant receives a certain income, without any condition, like unemployment or without contribution. This basic income you will always get, so you will always have a backup. An interesting fact is that decades ago this system has already been tested. You would expect that the whole population would stop working, but several tests showed that the opposite appeared to happen. People were more interested in their work, the omission dropped and the approach to work was more positive in general. Obviously some people will have advantage in this system, but the main question is: how many people do have advantage in our system nowadays? Would this amount of benefiting people be much less when you switch to another system? Is it necessary to rule from values or rule from enforcement? It is the world upside-down from what we are used to. But, who will pay for this? At the moment enforcement and bureaucracy around our current system are an enormous expense for the government. If these costs can be removed, it will save billions. Now we have to pay taxes, and when you assume the same situation, it should be sufficient. In our system nowadays people who do not work get money, and people employed by the government earn money. If we had a basic income, you can/should/may want to fulfil social jobs. Jobs like working with the elderly, child care, care in general, education, youth guidance in sports are jobs that benefit no matter what. Some countries want to test this system. Especially in Finland a majority approved to try this idea. Switzerland has to deal with some disagreement, but there are rumours that they are going to try the system as well. We keep this interesting thing in our minds. Because in our opinion the switch from �receiving benefits when unemployed� to �getting a base income and work�, is worth keeping an eye on. 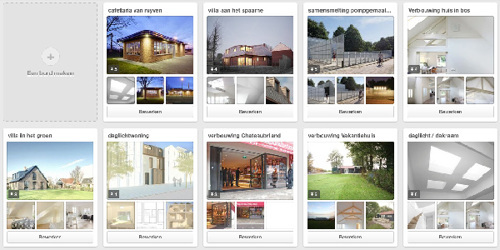 Architectuur is meer dan alleen een schets en meer dan alleen ontwerp. Het is het realiseren van die schets, van dat ontwerp, van een idee. En wanneer je dat niet doet verlies je een uitwerkingsslag waar nog heel veel in ontworpen en gewonnen kan worden. Voor echt kleinere opgaven valt er regelmatig wat voor te zeggen om de schets te laten bouwen en uitvoeren door de aannemer. Doen wij ook wel eens. 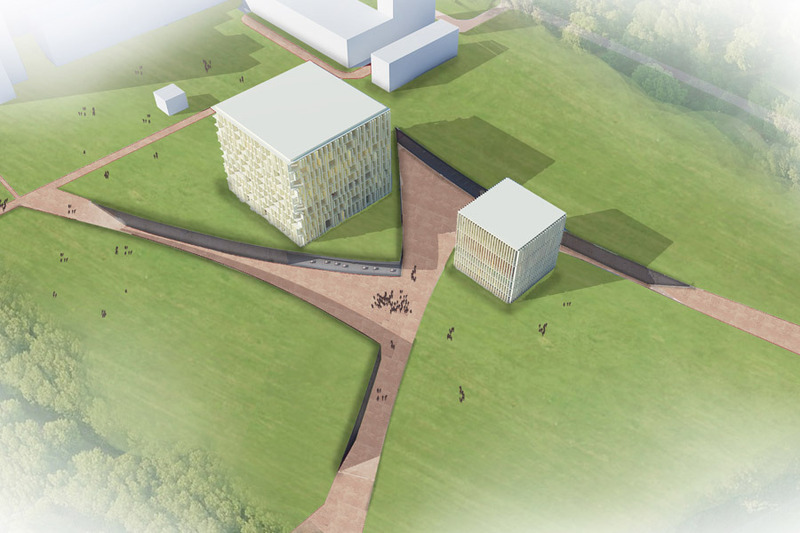 Maar wanneer het iets complexer en groter wordt (dat kan al zijn bij een goede uitbouw) is het detail zeer belangrijk. Er zijn diverse architectuur bladen en er blijven er ook redelijk veel bestaan. En dit ondanks dat het internet steeds belangrijker blijft worden. Het in handen hebben van fraaie referentie projecten met goede achtergrond informatie blijft waardevol. 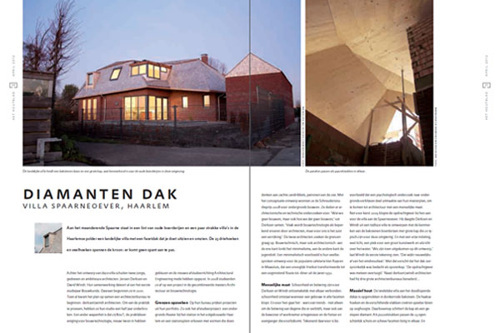 Het Duitse architectuur magazine DETAIL is zo een blad, en in onze ogen één van de beste bladen die er bestaat. 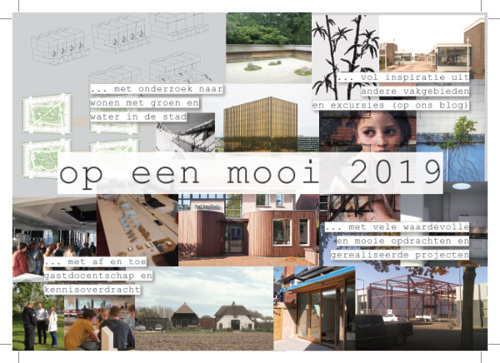 Kijk voor inspiratie eens op hun website (link). 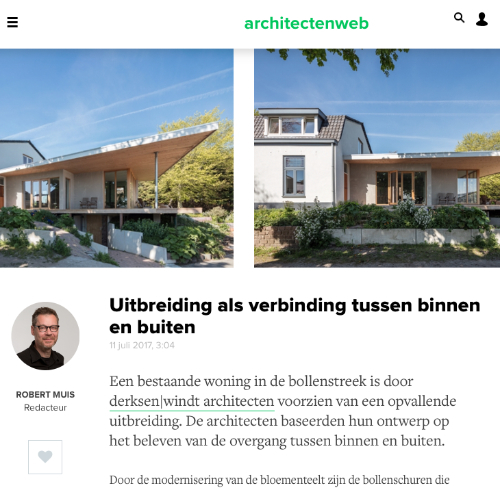 (Ze hebben uiteraard ook een blog en daarbij trouwens diverse echt goede architectuur boeken). 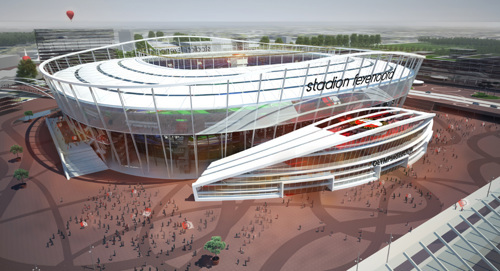 Bij ons bureau lopen er vaak diverse projecten die in verschillende stadia zijn. 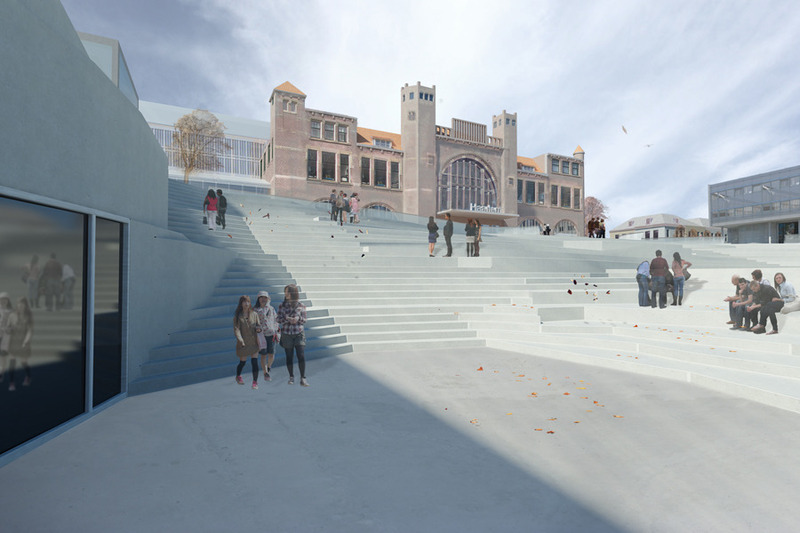 Er zijn projecten waar we het eerste ontwerp maken, bij andere projecten vragen we de omgevingsvergunning aan of loopt deze procedure, en weer andere projecten starten met de bouw. Dat laatste deel is toch het deel waarin een ontwerp echt gerealiseerd wordt en eigenlijk werkelijkheid wordt, voor zover het dit het nog niet is. Wanneer we een project dan ook fraai uitgevoerd tot realisatie zien komen is dat mooi. Momenteel is een periode waar (toevallig) meerdere projecten gebouwd worden. Bij deze stellen we u dan in het vooruitzicht dat u hier zeker meer van gaat zien en horen de komende maanden. De visies van James Turrell en Frank Lloyd Wright zijn in de zomer van 2013 samengebracht in een expositie in het Guggenheim in New York door curatoren Carmen Gimenez en Nat Trotman. James Turrell is één van de grootste en in onze ogen beste lichtkunstenaars die er is. Wij hebben zelf exposities van hem kunnen bezoeken en het is echt bijzonder wat hij met onze emoties en gevoel weet te doen. En dat met de combinatie van gebouw en licht. Daarom is het zo interessant dat juist hij iets mocht doen met de wereldberoemde vide van het Guggenheim in New York, ontworpen door Frank Lloyd Wright. 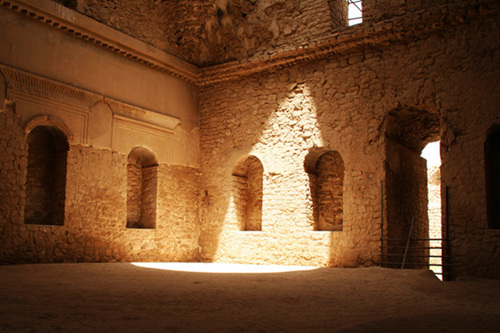 Een ruimte die zowel ruimtelijk als qua licht als qua ervaring van een tentoonstelling zeer vernieuwend en nog steeds zeer praktisch en fantastisch is. U vindt meer op de site van het Guggenheim (link). 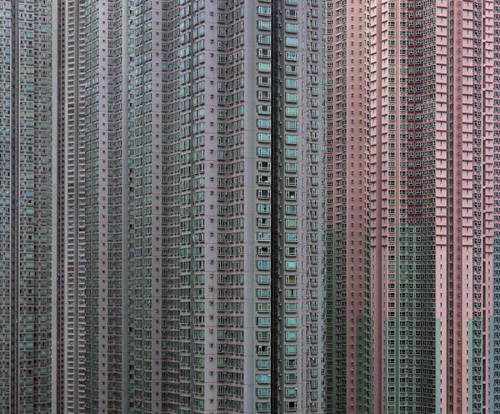 Michael Wolf is een Duitse fotograaf die al vele jaren in Hong Kong woont. Hij is gefascineerd door de echte mega-stad en door de cultuur in deze steden. Het is absoluut de moeite waard zijn website te bezoeken en door zijn werk heen te gaan. Wij vinden vooral de serie 'Architecture of Density' fantastisch en fascinerend en misschien ook wel beangstigend. Deze serie kunt u via deze link op zijn site vinden. Het beeld is kunst op zich, maar er wonen echt mensen. Het is in ieder geval iets om over na te denken. Wat ons zo aanspreekt is dat het beeld heel goed werkt. Vanuit de grauwere omgeving die vooral bestaat uit grijs materiaal is het volledig getransformeerd naar een kleurrijke omgeving. En dat doet iets met mensen. Daarnaast is het interessant dat de Nederlandse kunstenaars de schilders echt uit die 'slechte' buurt halen en opleiden. Deze mannen zie je vervolgens echt trots zijn op hun werk. Win win. Even iets heel anders. Maar zeker interessant. Tesla Motors. Tesla Motors is een bedrijf wat mede door de innovatief denker Elon Musk groot en belangrijk begint te worden in de auto branche. Zij willen elektrisch rijden echt mogelijk maken. Dit is op een slimme manier ingezet. Eerst hebben zij een roadster auto ontwikkeld waarop ze heel veel dingen hebben kunnen proberen. Vervolgens heeft Tesla Motors sinds 2012 een 'echte' auto op de markt in het dure segment. 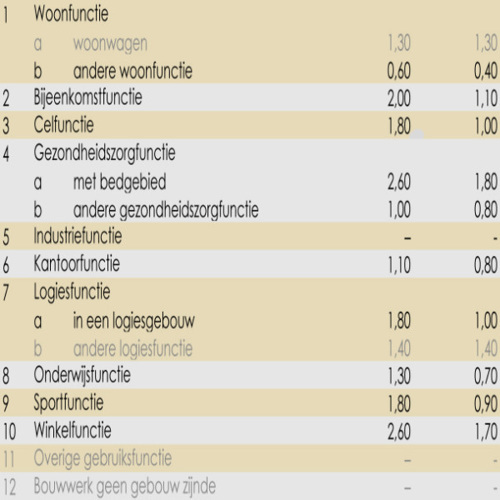 Hiermee kunnen ze verder ontwikkelen alvorens de stap naar andere (ook goedkopere) modellen auto's te maken. 'Model S en X' zijn naast elektrische ook nog eens mooie auto's trouwens. Maar het probleem bij elektrisch rijden is het bereik en de mogelijkheden om op te laden. Tesla heeft het mogelijk gemaakt om tot 500 km te rijden zonder op te laden, en dat is echt veel. Dat is qua afstand zonder laden (ruim) voldoende voor vele potentiele autobezitters. 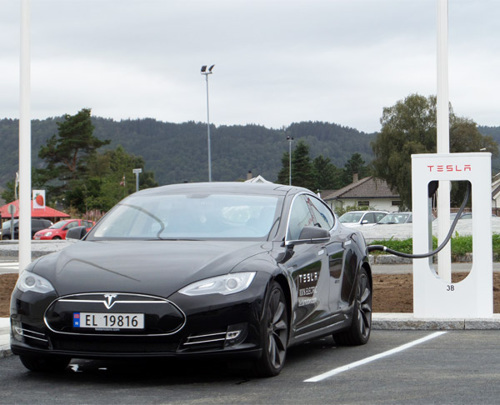 En minimaal net zo interessant: Wereldwijd zijn zij superchargers aan het neerzetten. In Noorwegen is dit begonnen, In Noord Amerika en Canada zijn er nu ook velen en eind 2014 willen ze bijna heel West-Europa voorzien hebben. Zo kun je (tijdens een lunch) binnen 20 minuten je auto half opladen. Momenteel zelfs gratis. 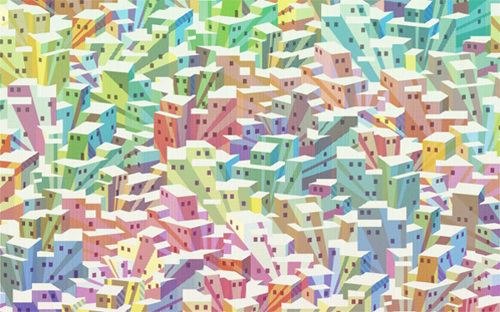 Tom Deininger is an artist who has been creating something new from small, often found, things. 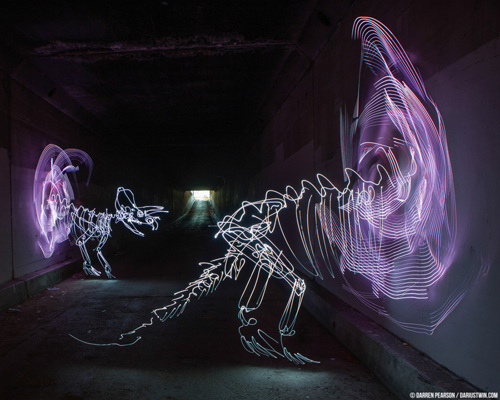 His 3D art amazes zoomed in and zoomed out. 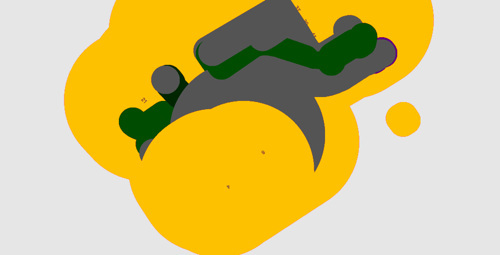 By starting zoomed in and slowly zooming out, you see (in the video above) the reverse of what you would see at an exhibition. The craftsmanship and creativity surprise us and we are happy to share this. You can find more by and about Tom Deininger here (link). 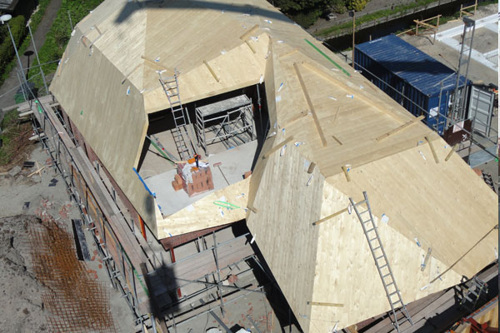 Every now and then we like to share some photos of projects that are in the construction phase, same here. For the enthusiastic clients, we were allowed to make a design for four business units in which the building as a whole and each unit individually have a high quality and finishing level. 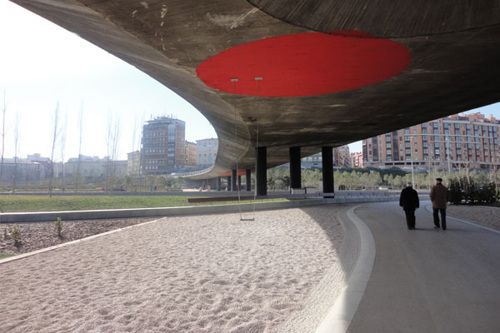 In a few weeks the completion is planned, and when we have beautiful pictures, more will follow. 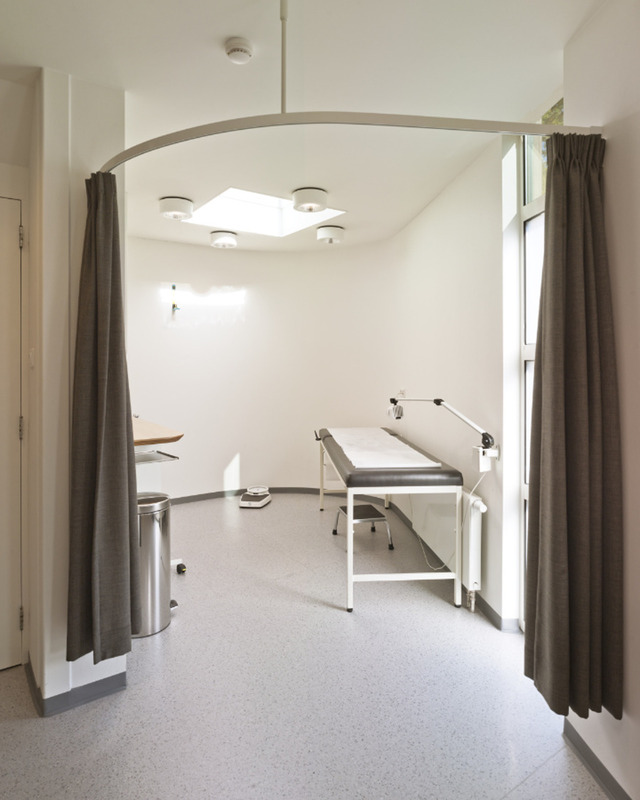 The GPs, who hold a practice in Maasland, were looking for extra space and a thorough approach to a new layout of the practice rooms. 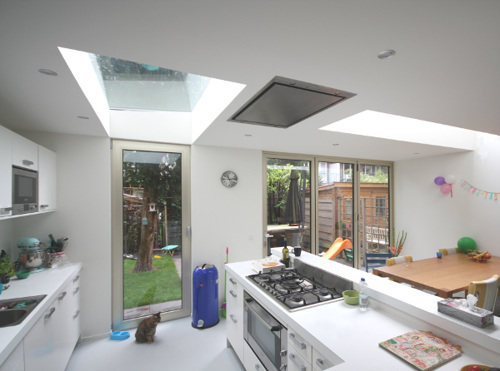 For this practice we came to an expansion that seems to fit effortlessly with the existing, typical building. The interior has been completely renovated, with almost all rooms on the ground floor changing function, position and size. More pictures and information about this project can be found on our website on this project page on our website (please click here). 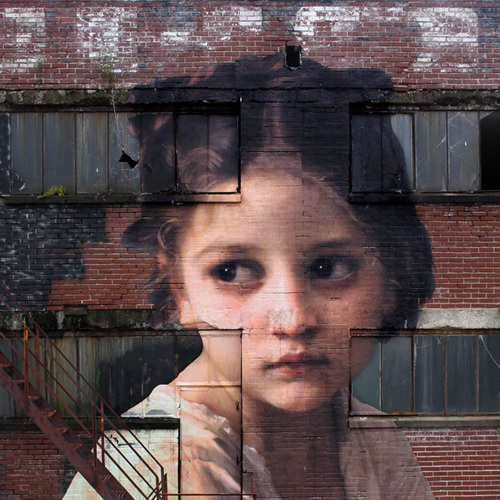 Julien de Casabianca uses his Outings project (link to instagram) to take art to the streets, literally. It results in fabulous situations where the brain is tested by the almost unreal combination in scale between 'museum art' and a building. Truly special. Make sure to visit his website for more work. This photo, entitled 'ringroad (houston)', is fascinating. The image in itself, by the composition and the colors. But also, what happens to the architecture and its context, the merging of the, at that moment 'glowing', building with the surroundings. 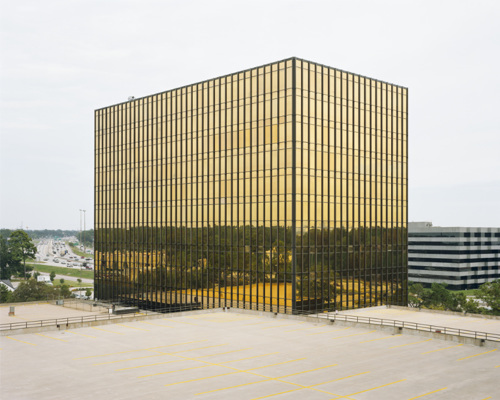 Bas Princen gives an architectural object (even more) meaning through his photography. And with this photo, even without explaining or adding anything, an appealing and inspiring image has been created. 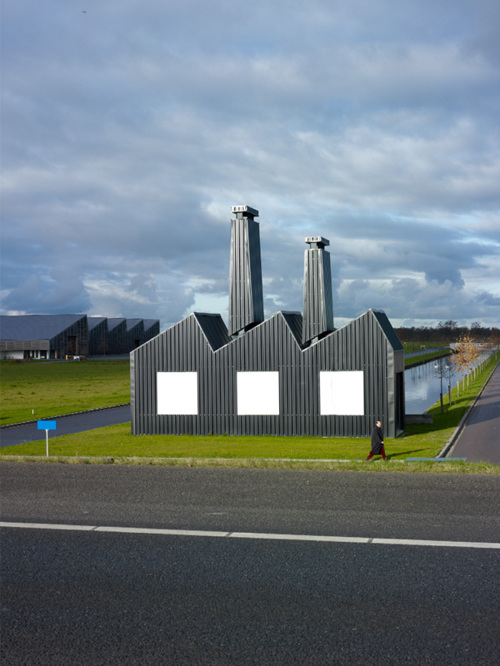 Dutch architect P.J.H. Cuypers on construction and architecture at the sixth international congress of architects in Madrid. In our view, a constructor may/should calculate what the architect designs, but the architect must (co-)design the structure. This quote is still relevant. Bremen is a (formerly very rich trading) city that is easy to drive to from the Netherlands. 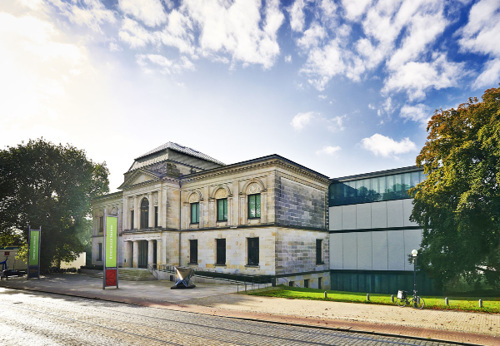 In addition to various beautiful areas in the city, the Kunsthalle Bremen is a good place for inspiration and culture. In addition to a permanent collection, there is a nice area in the museum for changing work. That part is the 'kunsthal-like' at this Kunsthalle, because unlike Rotterdam for example, this museum has a large permanent collection. Last fall we visited and were inspired by an interesting temporary exhibition about the work of Max Beckmann, and we saw a permanent arrangement by James Turrell, the light artist we wrote about earlier. Finally, the building itself has been extended in a clean and original way and is in a very nice location. Worth a visit we would say. It seems to become important to think differently about the concepts of work and income in the upcoming years. In order to guarantee a well-being for everyone in society, the traditional model (you work and get rewarded and otherwise are supported in some way) is probably not going to be sufficient in the future. Of course, we didn't just make this up, there are many economists writing about this and many governments thinking and working on this. Trends that are perceptible in large parts of the world are named as evidence for the predictions. For example, the increase in robotization, the shortage of (professional and trained) people in the (less well paying) jobs (how do you get the right people to do those jobs? ), The costs of the people who do not get to work now, governments which can not keep up with the necessity of grants and social assistance benefits, growing inequality with a truly poor part of the population, etcetera. As mentioned, in 2015 (see below this article in our blog) we wrote about a different way of thinking, the unconditional basic income. Not to promote this, but to play with the thought: Could this be something? 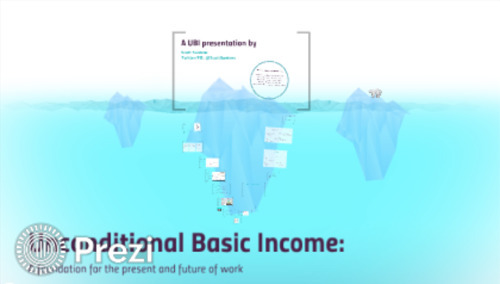 And now, a few years later, we want to show you, since there is a large number of countries thinking about or experimenting with the possible introduction, more about the idea of a unconditional basic income via a presentation by Scott Santens. He has been actively trying to promote the basic income for years, but in our opinion he explains what the content and context is about and where the opportunities lie. Enrich yourself with this knowledge. 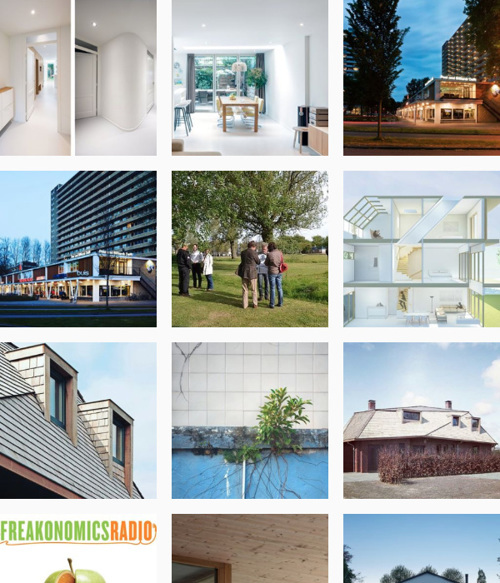 derksen | windt architects, after a longer period of passively usage of instagram, shares more updates and posts via instagram now. Follow us there as well. Economist Stephen J. Dubner is the host in the conversations he conducts with various guests on very diverse issues. 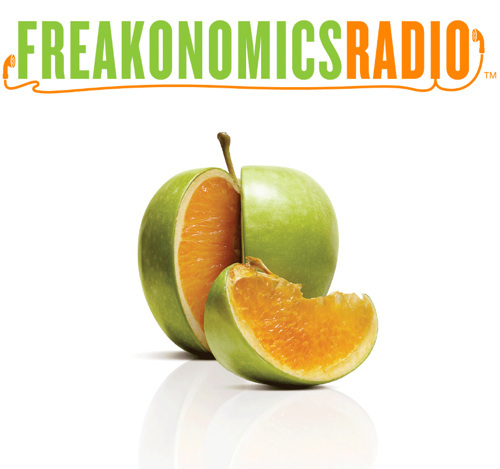 In 2005 he, together with with Steve Levitt, co-wrote a book, named Freakonomics, which became a bestseller. In this book they asked all sorts of questions for which they come up with clarifying insights and answers. The podcast (for those who do not know, this is a recorded conversation that can be downloaded / listened to) does the same thing. Every time there is a different theme or question for which, and this makes it so interesting, they come up with original answers and insights. This episode (click here) is a good example. It is about the influence of 'trust in each other' on 'prosperity and economics'. Very interesting to see what the connections are. And, like all episodes, the conversation runs well. Therefore it is recommended to follow this podcast. The term 'energy-neutral' is well known. 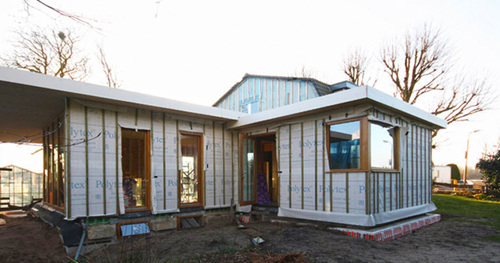 The demand from the Dutch government that all buildings built from 2021 have to be 'Bijna Energie Neutrale Gebouwen' (Nearly Energy Neutral Buildings) BENG may also be known. But these somewhat vague terms actually arise from the problem of excessive carbon dioxide emissions. 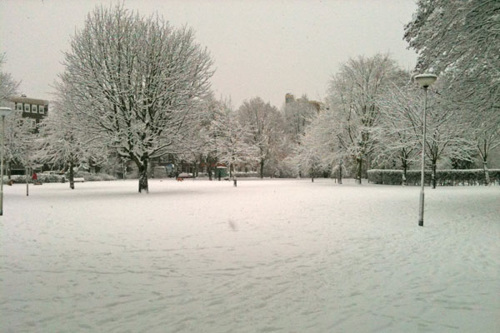 Building and heating buildings is a major cause of the increase of greenhouse gases (especially CO2) in the atmosphere. 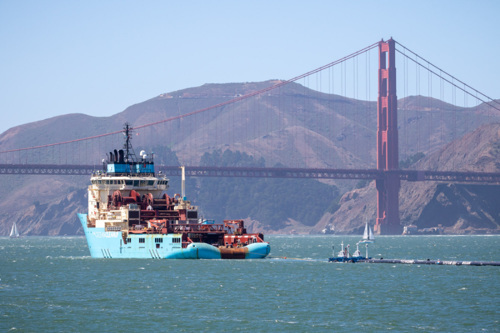 An important task for the near future is to reduce the use of non-renewable energy to 0. 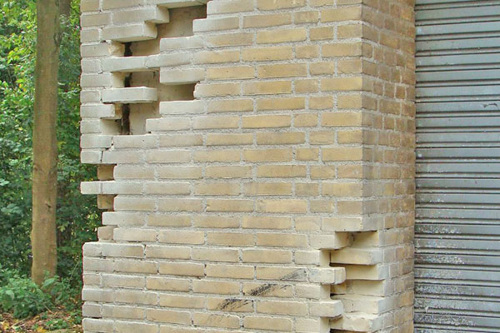 A subsequent step is that we also think about material choices and methods of construction. There is still a lot of research needed because there are many factors that affect the (proper) material choices (for example, edibility, lifespan, reusability, energy necessary to produce), but it's an interesting aspect to think about, as a building industrie in general, and more specific as architects. 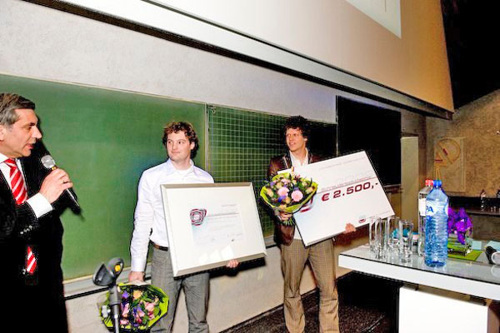 De Geofabriek (link) performs geo-analyzes, creating beautiful maps of geographical data and results. This is also the card shown above as a printscreen which can be seen here (link) digitally. The buildings which are still existing in Rotterdam are all marked in a color that corresponds to the building year of these buildings. This makes it very interesting to see how blocks of buildings, and entire districts, have evolved, with the second world war bombing of course as a visible event. In our eyes, the map is a nice graphical representation of otherwise hard data, and therefore worth the effort to scroll and zoom through. 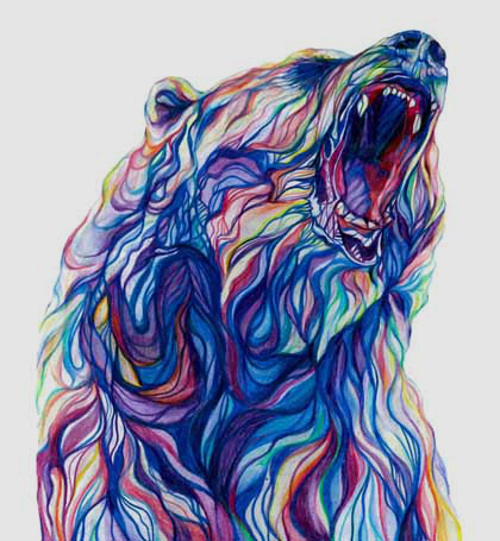 Étien' is a French artist who produces very diverse works. 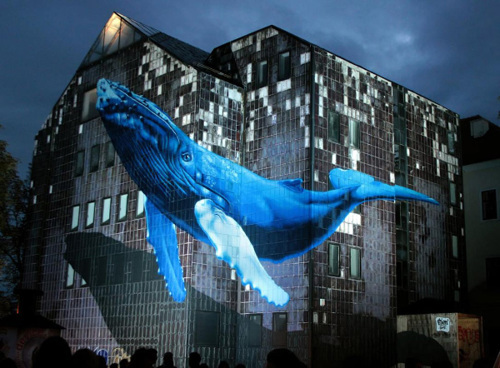 In Zagreb, on invitation, he made this huge painting on an existing building. What makes it extra special is that tghis artwork is painted in a way that it only appears completely and in the right proportions from one angle. 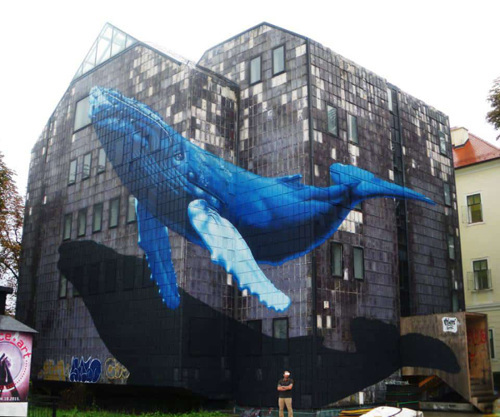 Since the whale is painted on striking buildingparts. You can find more information and interesting work on his website. Enjoy these day and evening images. 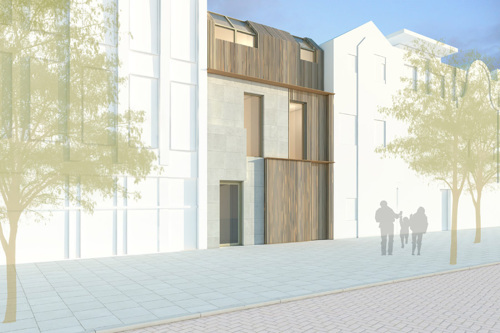 What can one do when there is a need for new houses in the inner city, but there is little space for these new plans? 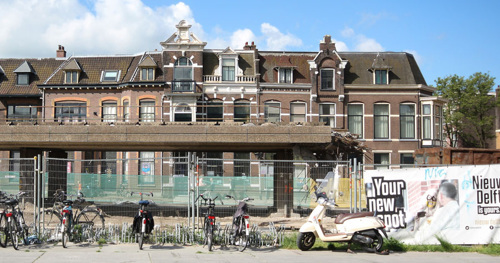 And what to do if the particular city (Rotterdam) knows it has to cope with its existing buildings with great respect and compassion? 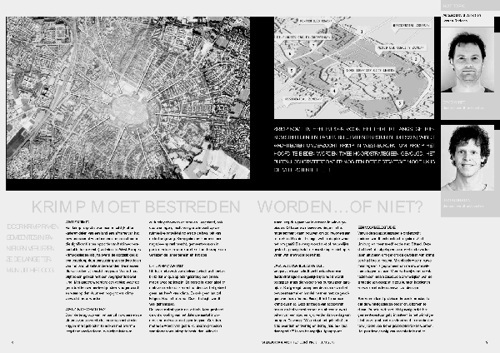 The BNA has done research, initiated by architect Marc Ibelings, on these questions in a research titled 'licht verdicht'. The results are described and is written about in this book. 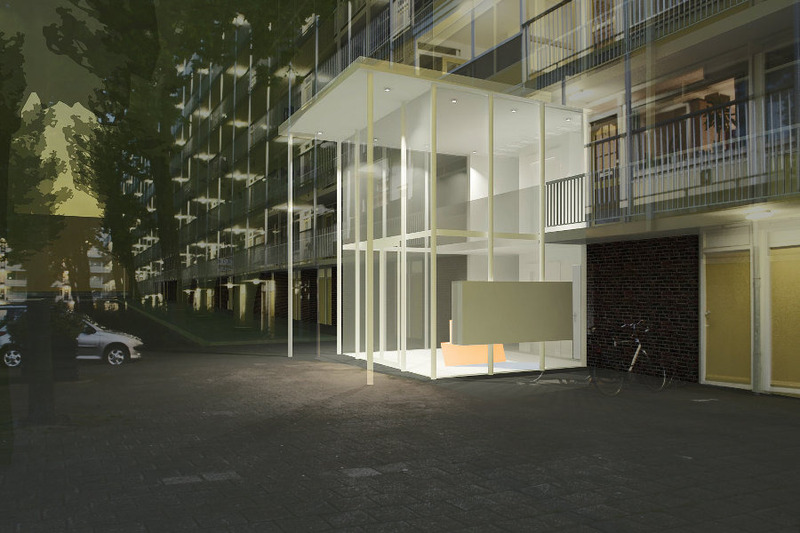 Marc Ibelings started this research because his architecture firm was able to realise a very nice multiple floored addition on top of an existing building by building very clever and light weight (see illustration). 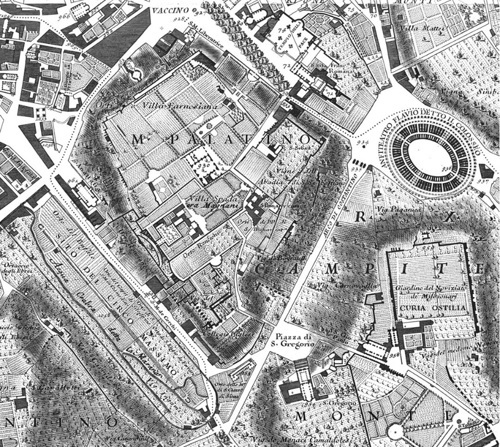 This plan has kept an important layer of the history of the city intact and was able to add new houses to the city. 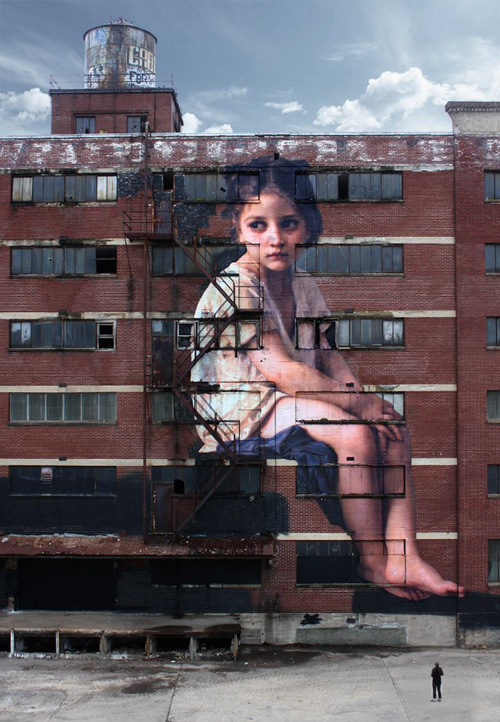 In our opinion, this is a good way to realize and maintain architecture and to add quality to an inner city. '0 on the meter house' is a Dutch term being used more and more frequently. 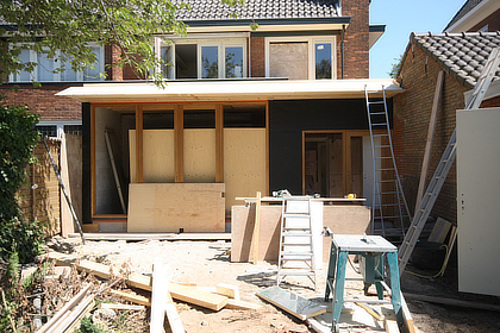 Up until a couple of years ago the building industry mainly spoke of the EPC (Energy Performance Coefficient), which revolves around the energy used for electricity, heating and light. However, it is more relevant to look at the total usage of a building. So, that, for example for a family home, the household (charging, water cooking, washing, etc.) is included. And what about the additional energy demand for schools. From our perspective, it is very useful and good to look at the total energy consumption. Therefore, since the start of our office, we follow the developments closely, go to conferences, and we try to contribute to the pursuit of energy-neutral buildings. Sometimes it succeeds, sometimes it does not, but it is important and good for an architect to discuss the concept and the possibilities with our clients. For more information, you can very well visit the website of 'De Stroomversnelling' (in Dutch) or this research (again in Dutch) done by the Dutch government. In 1993 D.K. Ruth and Samuel Mockbee started a studio linked to the Auburn University in America. 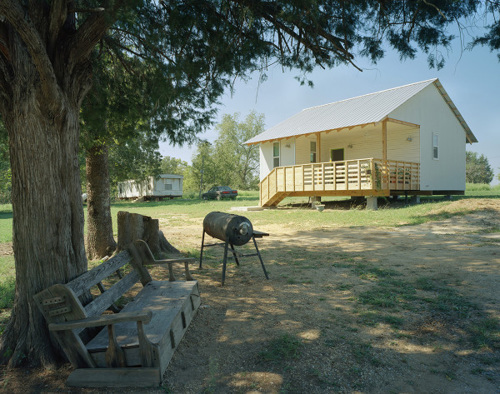 The aim of Rural Studio was to give the students a more hands-on education. 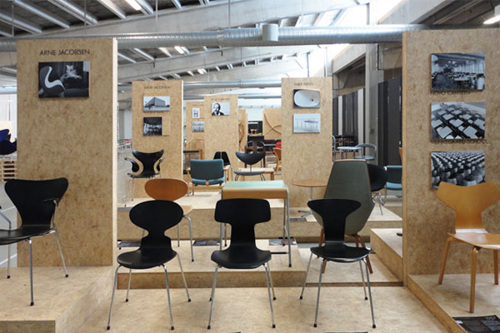 In its initial years the studio became known for recycling and reuse, in the past 15 years the focus shifted more and more towards social and community oriented work. This, of course, is inspiring, but most inspiring is that the studio focusses on making sure that the rich and the poor people, people in need, can profit from great design. Something we fully support. 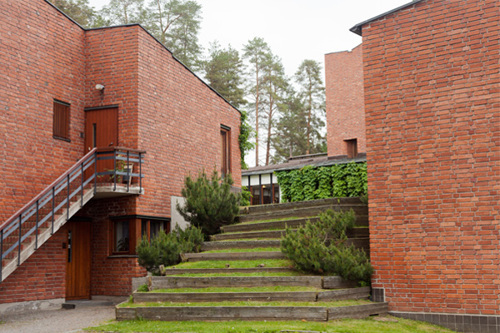 The pictures shown here are taken from houses designed in the 20K house series. 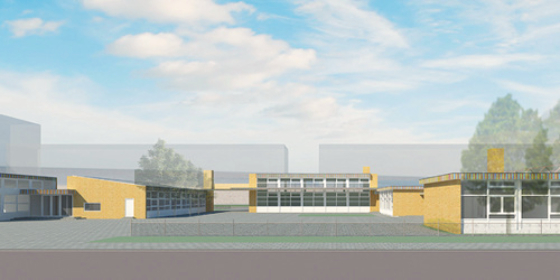 This is, as the name suggests, a project that aims to build houses for 20.000 dollars, done with the future inhabitants. You can find more here. 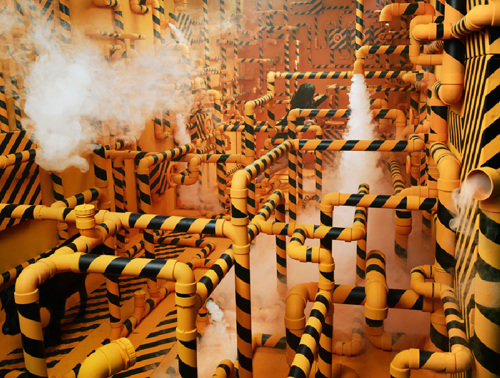 The artist JeeYoung Lee manages to bring worlds to life by building and creating arrangements, which sometimes takes her months. 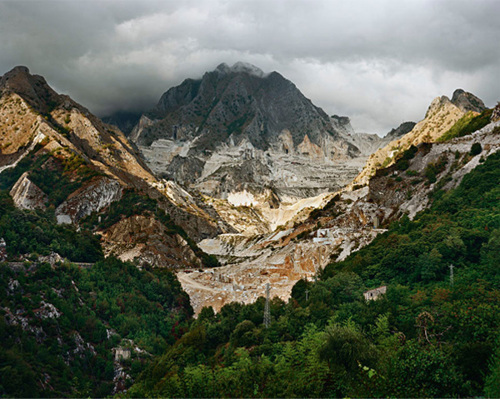 All is done in her studio where the created landscapes are photographed. It should leave us spectators in doubt, in an inspiring and eloquent way, about what is reality. In addition, these are self-portraits. 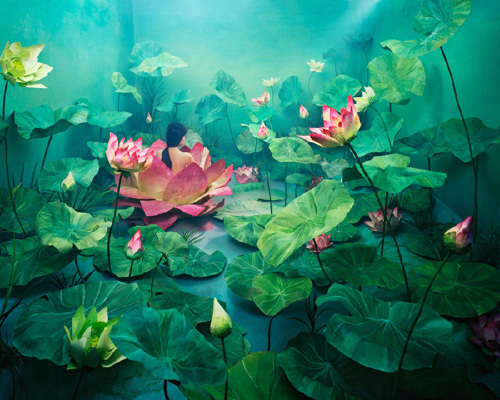 In the middle of the fantasy world, JeeYoung Lee herself is part of the proposed. The beauty is that there is an opportunity that your mind drifts to these new universes each image at the time. Here (click for link) you can see more amazing performances. In practically all tasks that we may do, we use 'real' models as an aid to design and in the end to present to our clients. 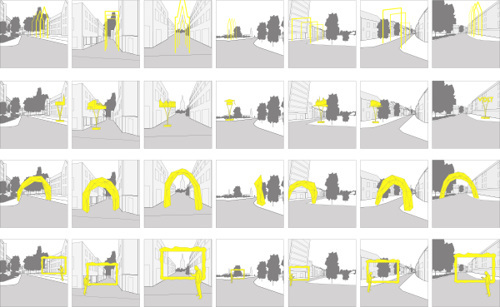 Firstly, these models give us a lot of insight into the several design options and how these interventions work in 3D. 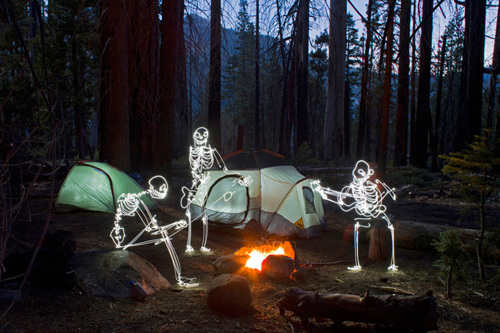 Secondly they clearly visualizes our ideas to the clients. The models are often well received by our clients, so most of them don�t end up in our office, but in our clients home or office. But that certainly does not stop us making good, instructive and beautiful models. These two photos are a sample of our models. Our clients in Amsterdam gave us the opportunity to make a design for their home, do the elaboration and guide the project until completion. They live in a beautiful and popular antebellum residential block with a large courtyard garden, which is divided in private backyards. This spacious backyard provided the ideal opportunity to transform the already beautiful dwelling into a contemporary family house. 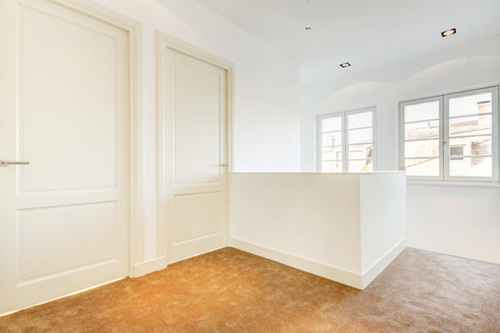 We created a large entrance, many bedrooms, a large bathroom, and a beautiful, light-flooded, kitchen. More about this on the project page (click here). 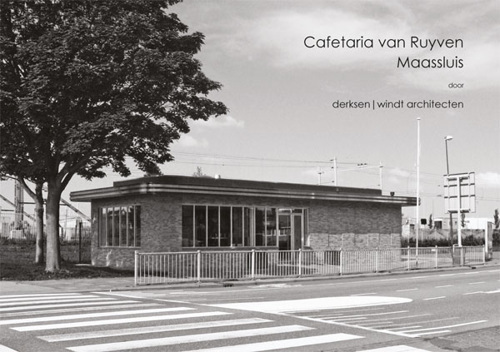 Willem Marinus Dudok is one of the most famous and influential architects in the Netherlands of the twentieth century. His fame and influence reached far beyond the Dutch borders and was praised in Japan and America. You probalbly know some of his most famous buildings (the town hall of Hilversum for example). Less well known is that the original Bijenkorf warehouse building in Rotterdam, which was built before World War II, was designed by Dudok. 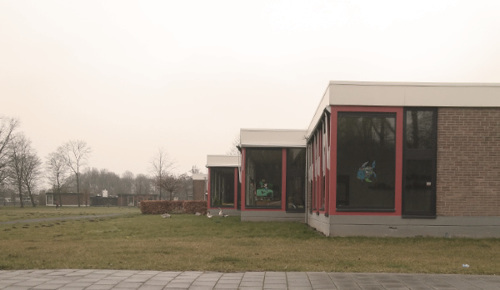 About this razed and forgotten building, Peter Veenendaal (klik voor link naar zijn site)journalist and architecture fancier, created an imaginative documentary. 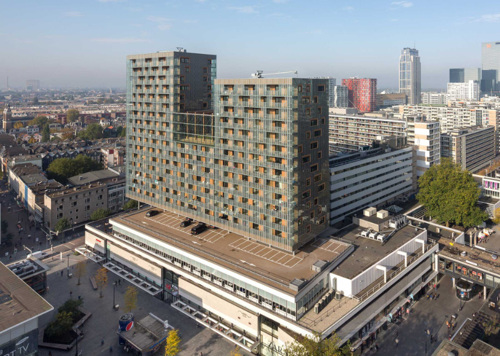 The design of the Bijenkorf Rotterdam appeals to the imagination and compared to the contemporary warehouses it is very different. 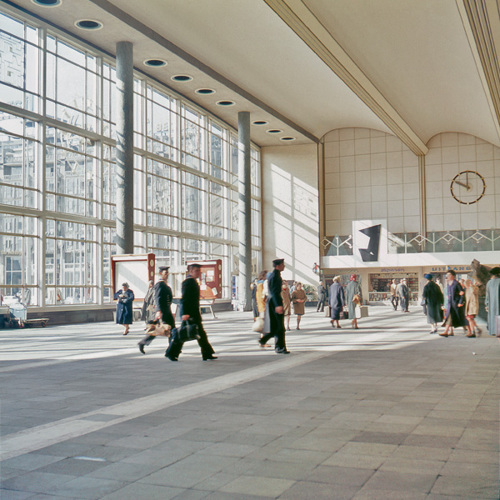 The design was light and spacious, it must have been a delight to wander around there. 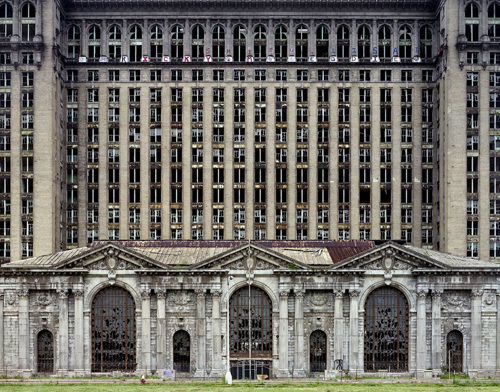 Enjoy this well-crafted, compelling and inspiring short documentary about this fantastic building. 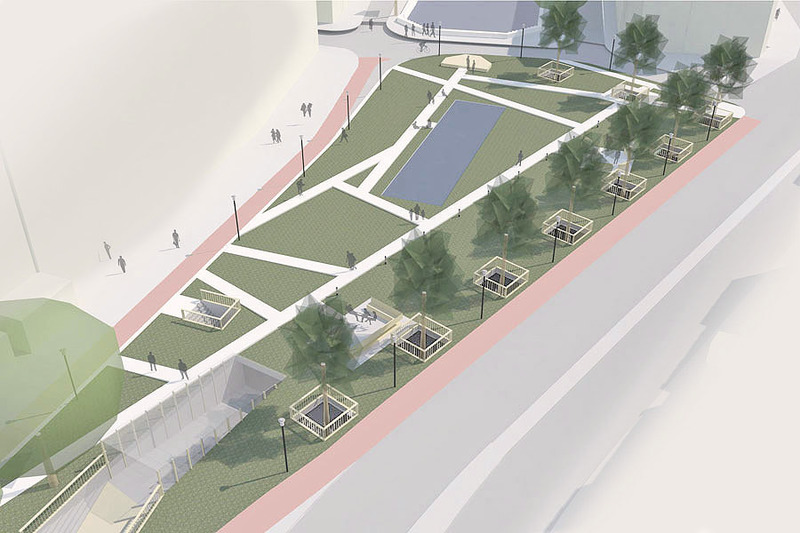 Commissioned by the Amsterdam city council a few years back, we have made a design and feasibility study 'underground bicycle storage Klein-Gartmanplantsoen' and presented it. This task concerned the bike parking issue around the Leidseplein, and with the aim of finding a good solution for a part of this problem. We have taken this task broader, so we involved the public space in the design and made an integrated plan for the whole area. After years of wrangling which was the best design option for the bicycle cellar, we came up with our design option. A design with capacity for 2000 bicycles and in our eyes the best solution to the problem and the feasibility. Our plan was received well and we could make the final draft. 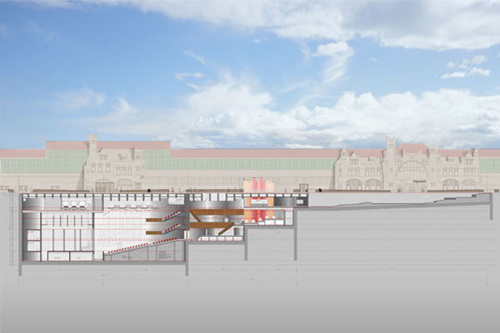 Unfortunately, the city council of Amsterdam decided to contract another design agency, with more experience in the field of bike parking cellars, for the elaboration of the project. We can say this without rancor, this is how it works sometimes. 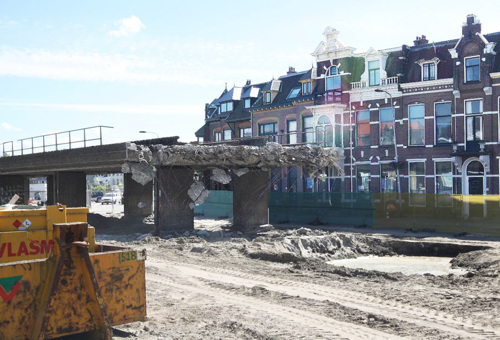 We are proud of the results of our study commissioned by the municipality of Amsterdam. Beside the several social media platforms where we can be found and share our news, now there are also some of our projects on pinterest. You can find our page here (link). 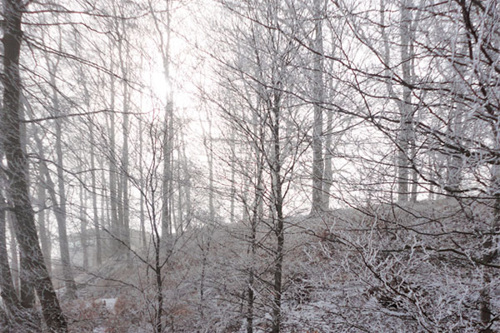 To start 2016 inspiring, we recently visited the Ruhr. Something that has been on our list for a long time. During the industrial revolution the Ruhr grew into one of the largest industrial areas of Europe. Although a lot of industrial activity is still there, due to the coal and steel crisis the industry in the Ruhr has reduced strongly. 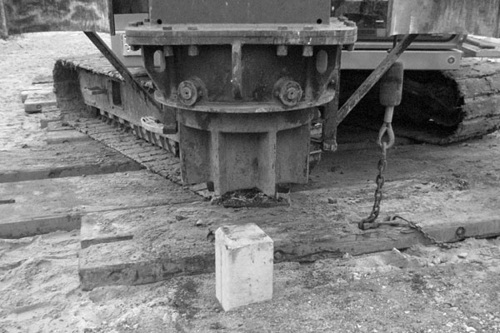 For example, in 1986 the coal mine in Essen locks. Just as in the Netherlands (For example Limburg), this sort of shrinkage has consequences: a lot of vacant factories, offices and industrial sites. This resulted in a demand for new spatial developments. 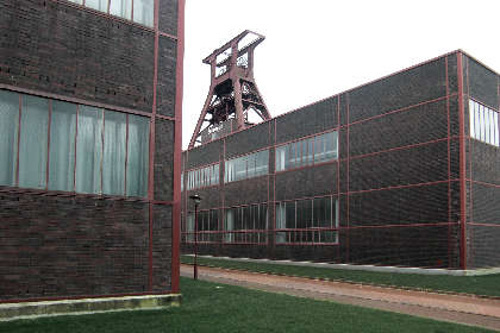 In 2001 the factory complex Zeche Zollverein in Essen came on the UNESCO World Heritage List and in 2010 the Ruhr became the cultural capital of Europe, resulting in many good and most creative spatial developments. In and around this factory complex, a number of famous architects (SANAA and OMA) contributed. The old factory is preserved and open for visitors. 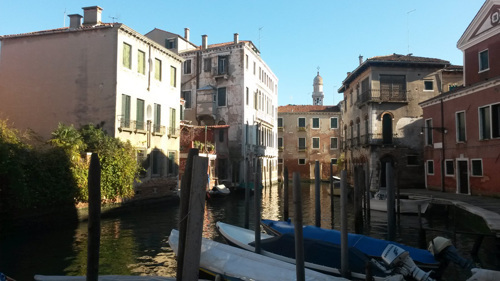 A very inspiring and impressive environment, which is certainly worth a visit. This quote from the book Game of the Angel (2008) by Carlos Ruiz Zafon, is a quote which sticks with us. 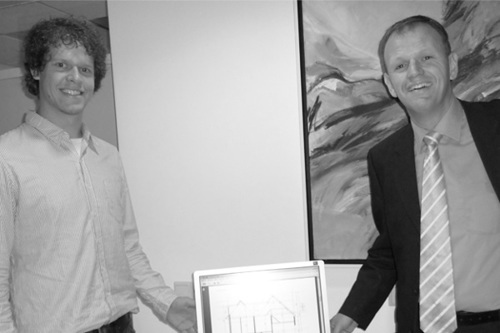 And now we are developing our architecture studio since 2008, it shows that the balance between science and art is very important to us. 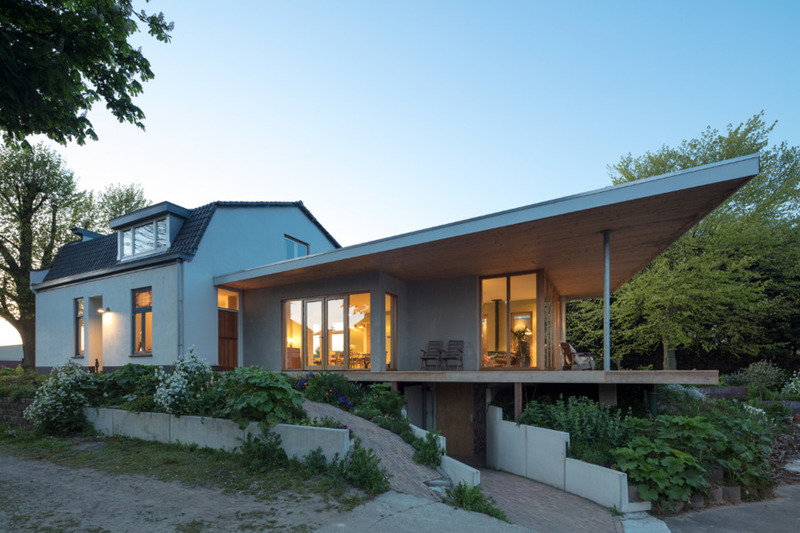 On the one hand architecture is producing and performing renovations, extensions, buildings and public spaces. But on the other hand, when it is possible and the contract allows us, architecture is more than that. It is also a creative process, which does not follow a certain path, like much other professions. That is exactly what makes architecture and design interesting. There are tasks that require drafts with innovation and inventiveness in it. But other task, which require more research, sketches and spatial studies, ask for more in order to find the best solutions. We experience this balance as a very interesting tension. 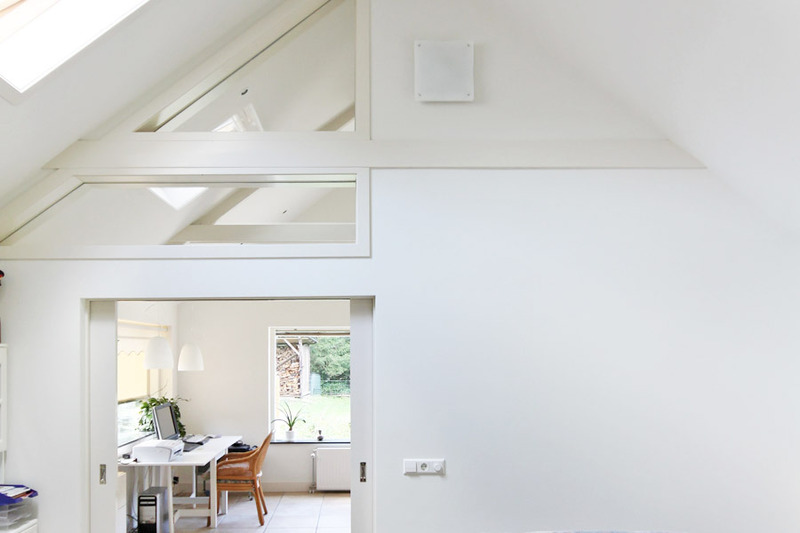 For our clients in Amsterdam we had the chance to make a design for their house, to do the elaboration and guide the project until completion. They live in a beautiful and popular antebellum residential block with a large courtyard garden, which is divided in private backyards. 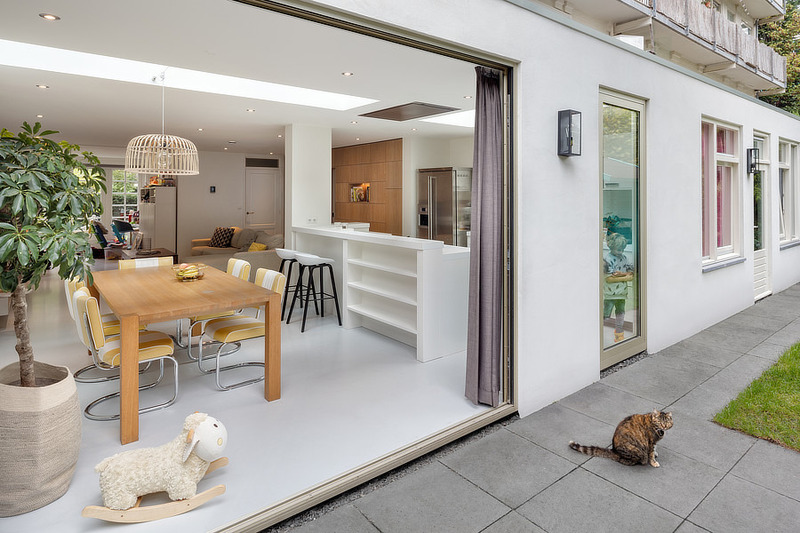 This spacious backyard provided the ideal opportunity to transform the already beautiful dwelling into a contemporary family house. Together with our clients we came to a program of requirements and wishes: many bedrooms, a large bathroom, a spacious an light-flooded kitchen and a proper entrance. In our opinion these wishes did come back really well in the design. Everything is optimized to a nail. The construction work has been completed, the next few months they will do the finishing touch with the furniture. Upcoming spring we expect to show you some more pictures. For now this photo, for more information you can contact us of course. 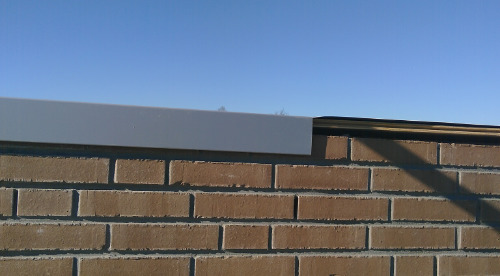 Because in our point of view, the homes that have a good backyard, will be enriched with this kind of adjustments. A team of researchers at Michigan State University in America has developed a transparent solar panel that creates solar energy, without blocking the view through the window. Read the article here (click). 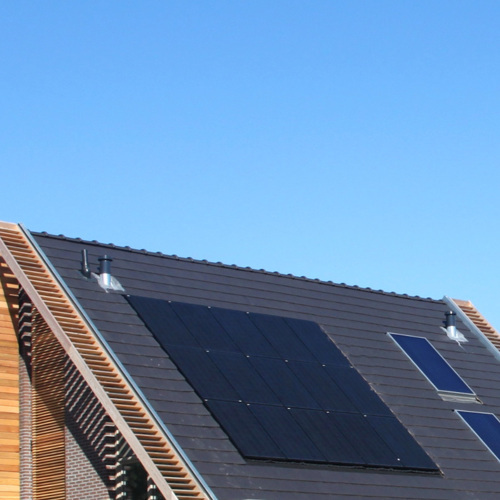 The researchers emphasizes that the solar panel still in development is in order to reach higher efficiency, but this is definitely a step in the direction of a big breakthrough for our built environment. 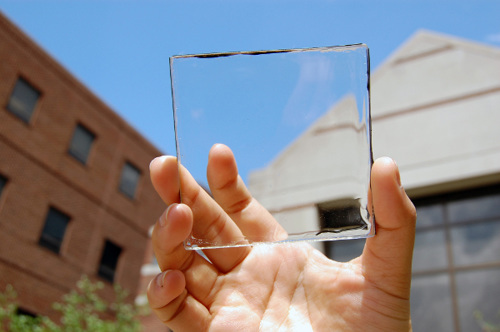 Imagine that your glass can be replaced with glass that generates energy! It will be hard to operate more locally or efficient than this. Het Nederlandse initiatief Fairphone bracht twee jaar terug een telefoon via crowdfunding op de markt. Een eerlijke telefoon was het streven, een telefoon gemaakt door mensen in humane omstandigheden en gemaakt met eerlijk gewonnen materialen. 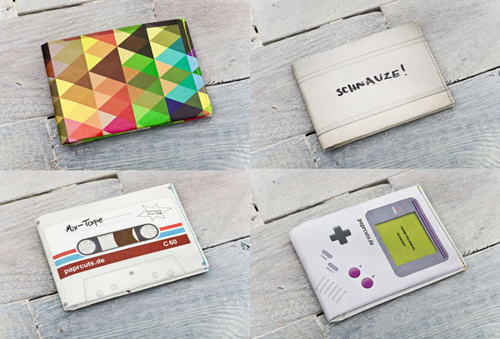 Wij hebben deze telefoons destijds besteld om het project te steunen en gebruiken deze naar wens. Nu komt er een tweede variant, die, meer dan de eerste, nastreeft echt in onderdelen vervangen te kunnen worden waarmee er een langer leven bestaat voor de telefoon en de materialen. Daarnaast blijven de initiatiefnemers hun duurzame uitgangswaarden natstreven. Een heel mooi initiatief in onze ogen. Dat kun je op twee manieren doen vinden wij: 1. slopen en iets nieuws bouwen of 2. het oude laten staan en opwaarderen. 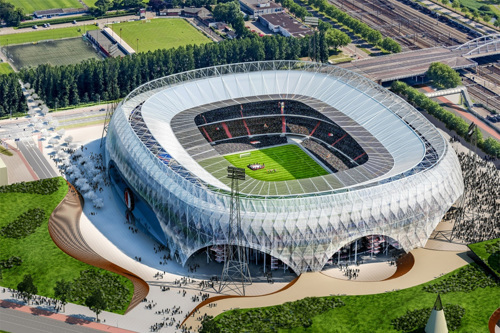 De derde optie om het te laten staan en dan ergens anders nieuw te bouwen is alleen een optie als er echt een goede nieuwe functie is voor het oude stadion waar ook echt behoefte aan is. En naast dat de keuze voor optie twee de meest duurzame keuze is, is er altijd bij dergelijke projecten een emotioneel aspect wat zeer belangrijk is. 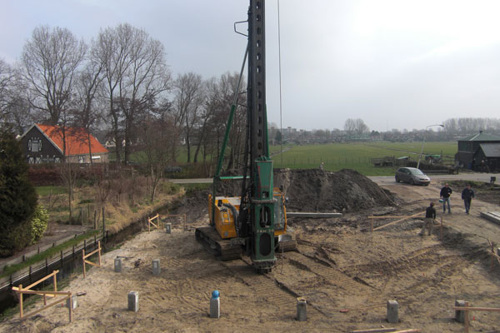 In 2009 was er de grote prijsvraag voor het nieuwe bouwkunde genaamd 'Building for Bouwkunde'. 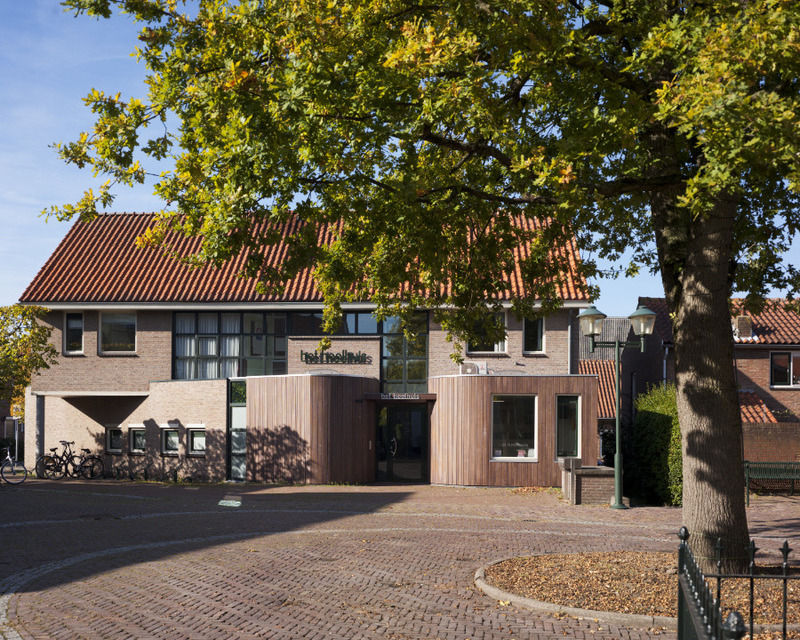 Aangezien wij in het eerste half jaar van 2008 afstudeerden aan diezelfde faculteit die in vlammen op ging deden wij hier met ons één jaar bestaande derksen|windt architecten aan mee. 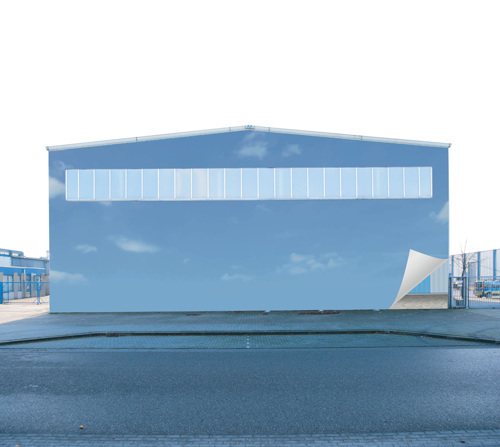 Wij maakten een in onze ogen goed ontwerp met een sterk concept en dachten dit met enkele dagen uit te kunnen werken naar het niveau waarop wij het wilden presenteren. Helaas lukte dat niet, hier was echt meer tijd voor nodig. Les geleerd. Uiteraard daardoor niet goed genoeg kunnen presenteren en geen selectie kunnen afdwingen. Maar de afgelopen jaren bleef het idee hangen om enkele mooie renders van het ontwerp te maken. 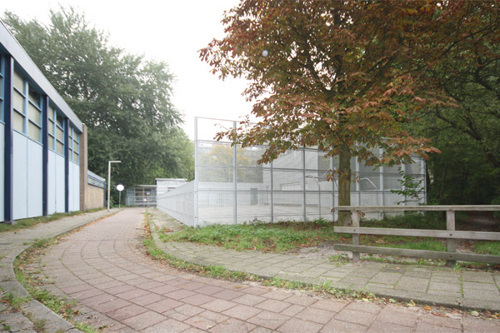 Na de media aandacht voor het project Cafetaria van Ruyven zijn we erg trots u te vertellen dat ook het project 'samensmelting pompgemaal en speelplein' te Delft heel veel aandacht krijgt. 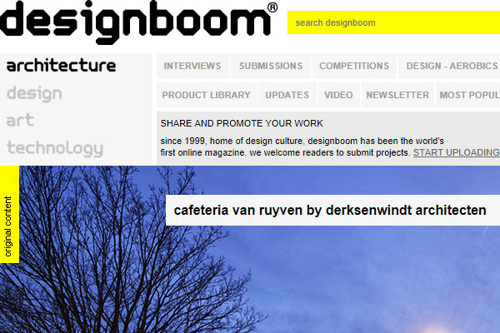 Wellicht denkt u als volger van ons dat bijvoorbeeld Designboom bijna ieder project publiceert. Want we staan er weer op. Maar dit is echt bijzonder. 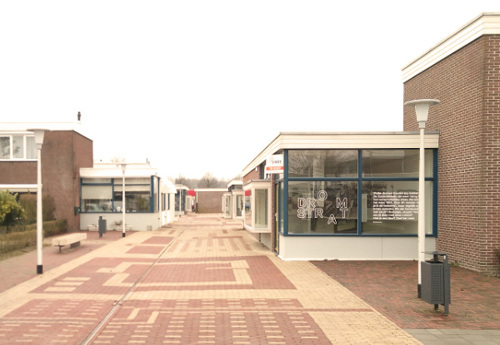 En dit keer heeft ook Archdaily besloten ons te publiceren. 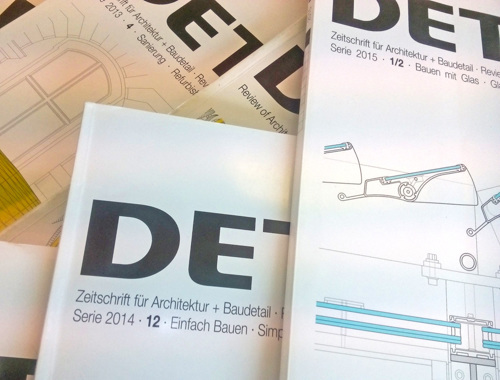 Samen zijn deze magazines, met miljoenen bezoekers per maand (letterlijk miljoenen) de grootste design en architectuur magazines wereldwijd. Maar het rondje, wat nu de verkeerde kant op gelopen wordt, moet andersom gelopen gaan worden. Een patroon moet doorbroken worden. Ook wij als ondernemende Nederlanders moeten een positieve instelling aannemen. Uiteraard is het nu rustiger bij bedrijven en winkels, en uiteraard zijn er veel mensen die het echt lastiger hebben dan voor 2008, maar het helpt niet dat alleen te benadrukken. Dat is die tendens waarin we nu al vijf jaar zitten en we schieten daar echt helemaal niets mee op. Misschien is het te simpel gedacht, maar misschien is het niet ingewikkelder dan dit: Positief blijven kijken naar kansen in de toekomst, in plaats van alleen maar kijken naar de donderwolken en wellicht zwaardere tijden die komen. Als mensen echt proberen door te pakken en voort te gaan, in plaats van krampachtig aan de bestaande situatie vast te houden, zou alles weleens sneller goed kunnen gaan dan nu gedacht. 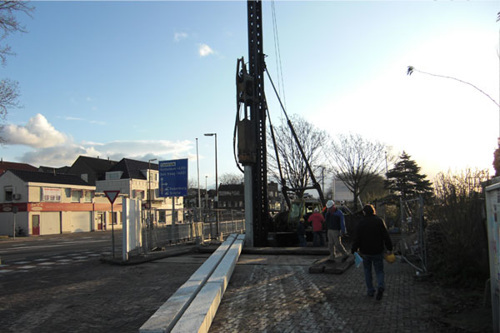 Een eerste kijkje bij de bouw van ons recente project, een renovatie van een klein industrieel gebouw te Delft. 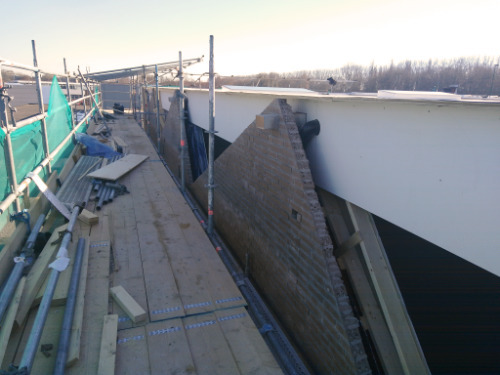 De bouw start met herstelwerkzaamheden aan het metselwerk. De volgende stappen zijn herstel en vervanging van boeidelen ramen en (rol)deuren. 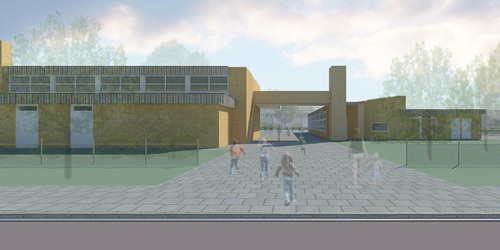 Daarna komt ons ontwerp echt tot uiting door een tweede gevel voor het gebouw. We houden u op de hoogte, zullen u af en toe kijkje geven in het project en wanneer het af is komt er een mooie reportage van.